To Sagman and the Termal Hotel. 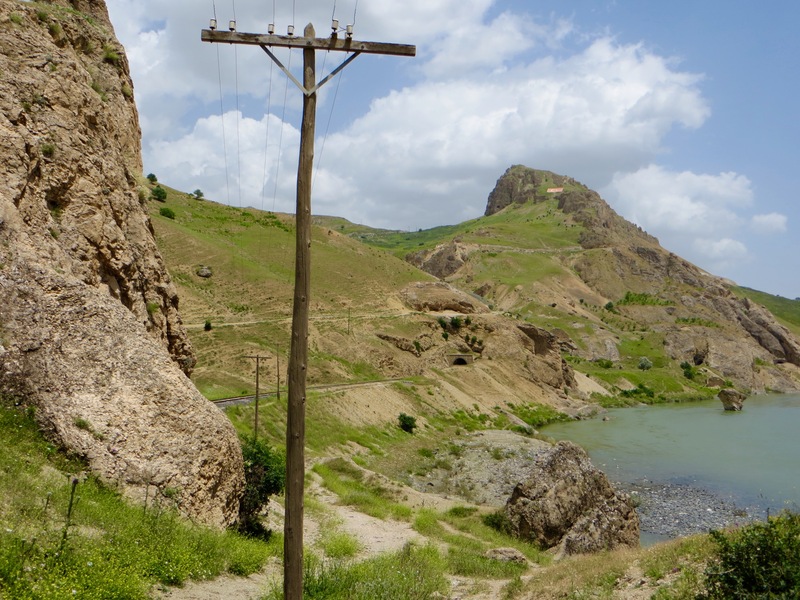 Because the road to Sagman begins beside the reservoir and Sagman itself is high in the hills and mountains, the ascent is quite demanding for someone aged over sixty, and it is made a little more challenging because the village is 10 kilometres away. 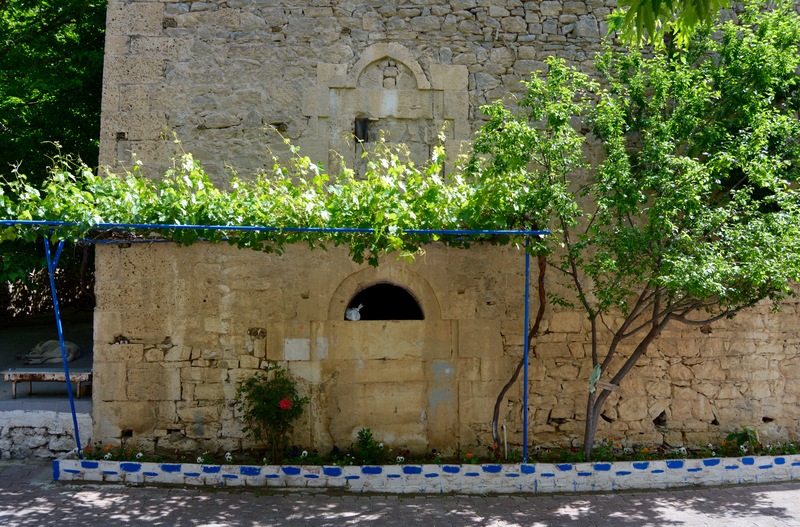 Moreover, at only one point can you get fresh water, at an improvised cesme dependent on a hose to bring liquid refreshment to people on the road itself. 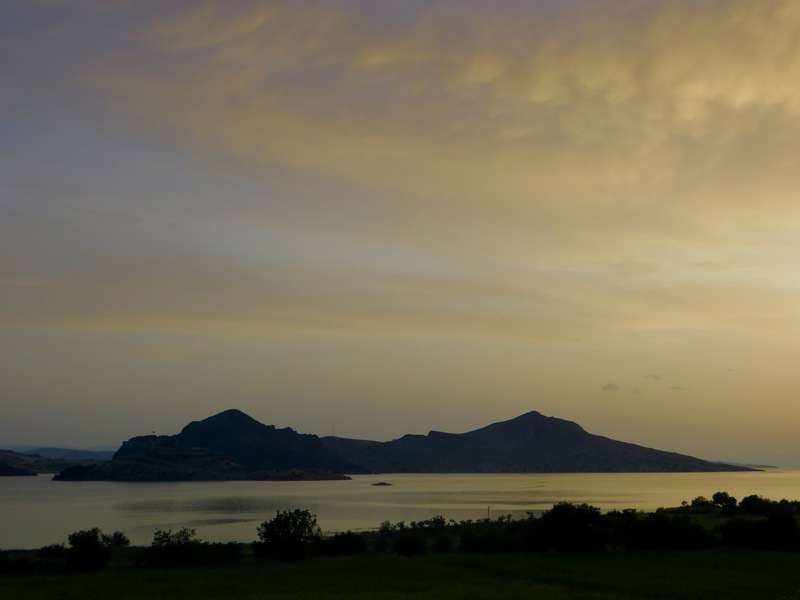 On the positive side, the views over the reservoir and the surrounding hills and mountains are never less than excellent and two men kindly gave me a lift for the last 3 kilometres. Sagman itself is a predominantly modern village that clusters quite tightly around a recently built mosque, but, because it lies on a gently inclined slope dominated by pasture with stunning views in all directions, I found it most attractive, the pitched corrugated iron roofs included. By now there was, albeit briefly, bright sunshine and I felt elated. View south from the road to Sagman. 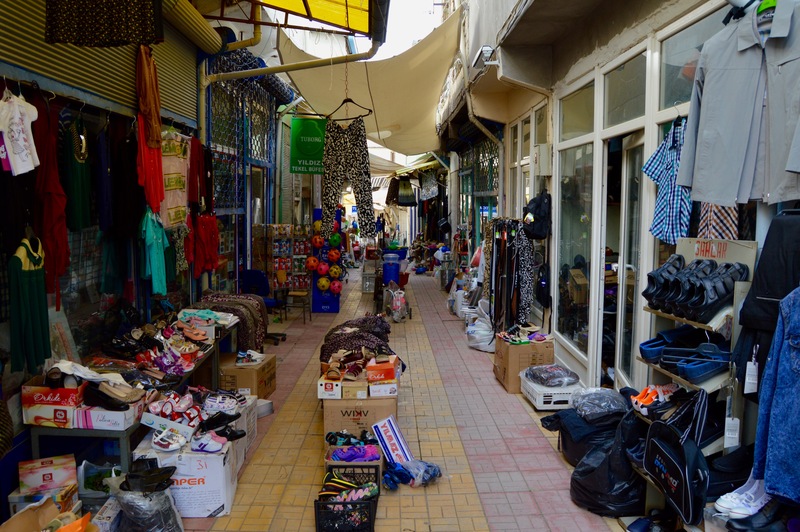 I was dropped in what passes as the centre of the village, a small open space enclosed by a few buildings, two shops included. 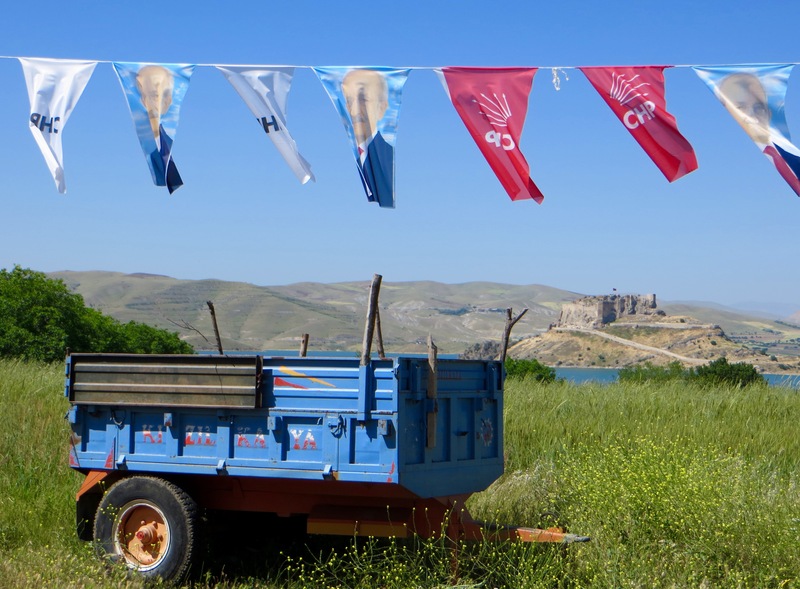 There were also some parked motor vehicles, three of which were minibuses that carried people to school, Tunceli or Elazig. 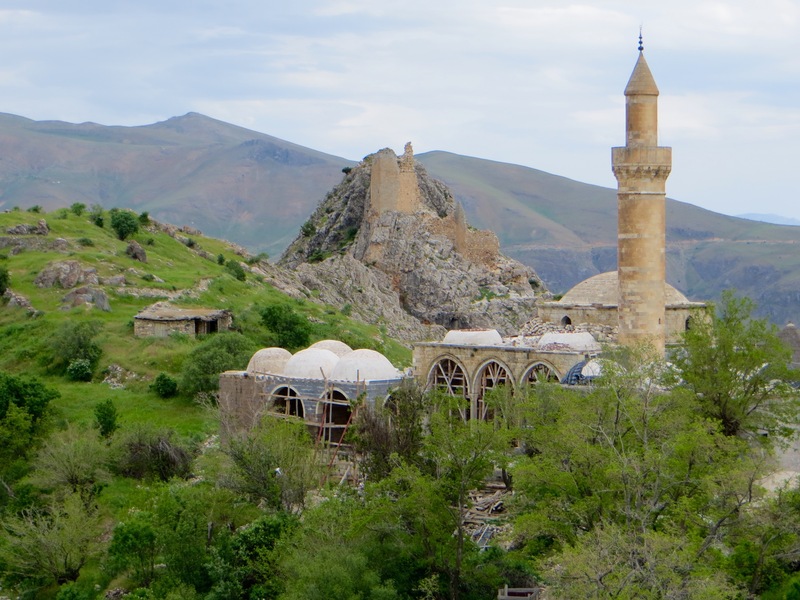 After admiring the extensive views over the pasture toward hills, mountains and the reservoir, I set off along a dirt road that led after about 2 kilometres to the mosque and the castle that are Sagman’s main claims to fame (the old town of Sagman, which has now almost completely disappeared, was located close to the castle and around the mosque. The present village cannot be more than fifty or sixty years old). For most of the way the road was level or gently inclined in my favour, which made the walk an easy one. Mules and horses in a quantity not witnessed previously on the trip ate the pasture and looked in good health. At the easternmost extremity of the village a jandarma post was still occupied by men in uniforms. 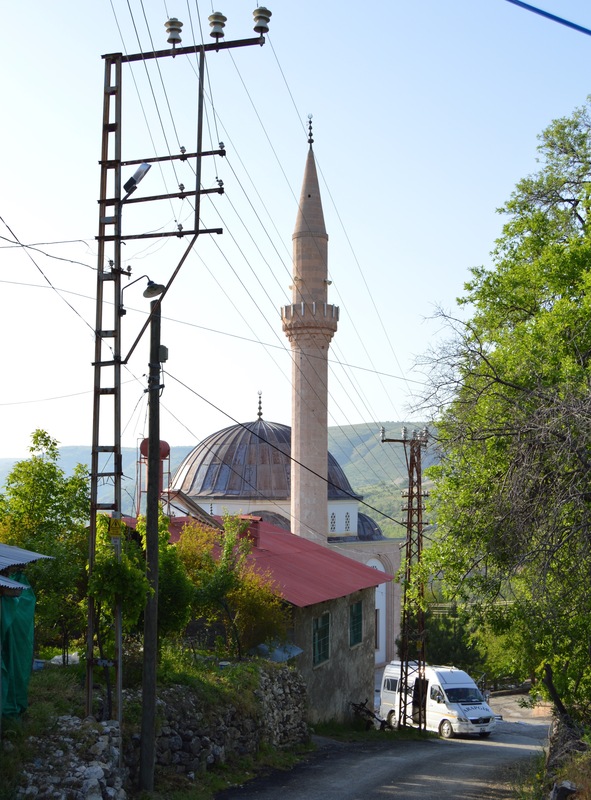 I turned a corner and ahead was the mosque in front of the castle. Both had been built at more or less the same height above sea level, but a distance of about 250 metres lies between them. The castle is on a rock a little higher than all those near it and the mosque is above a slope descending to a river far below to the south. 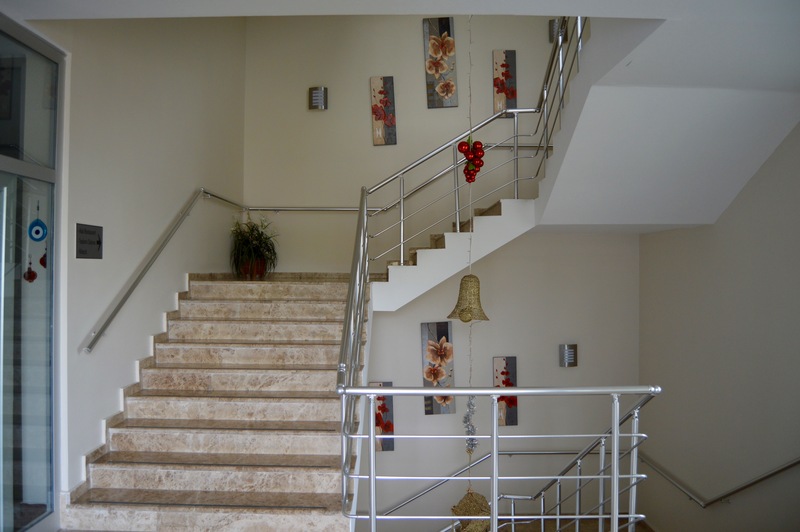 Both structures are surrounded by stunning upland scenery of mountains and deep valleys. I was thrilled by the prospect of looking around for about an hour or so. 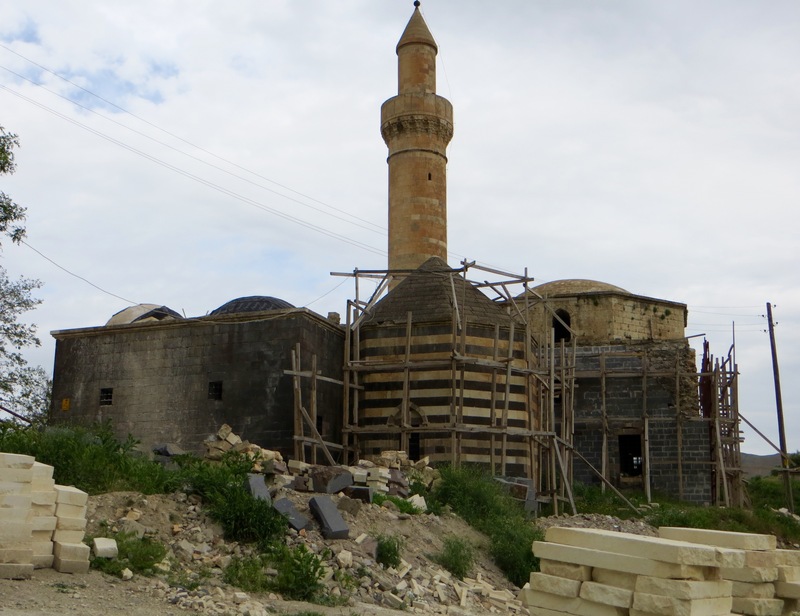 The mosque and castle, Sagman. 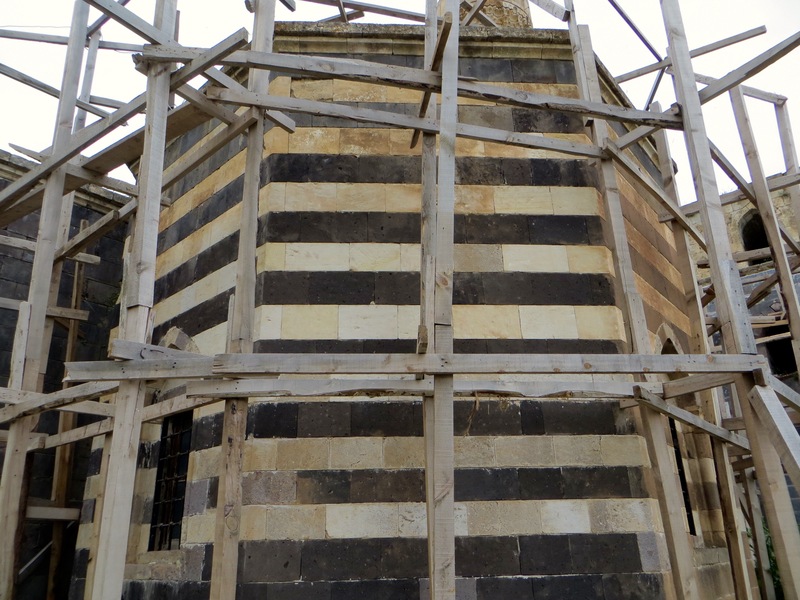 To the w. the octagonal turbe is bonded with the complex of rooms: its north face is formed by part of the back wall. Its low sides are executed in an alternation of black and white courses. What survives is the walls fortifying the westerly arm of the castle rock, i.e. that pointing towards the mosque… The corner of the n. and sw. faces is of cut stone, and so is the polygonal, but slight, tower in the middle of the sw. face. Otherwise the masonry is of uncut or roughly hacked blocks. 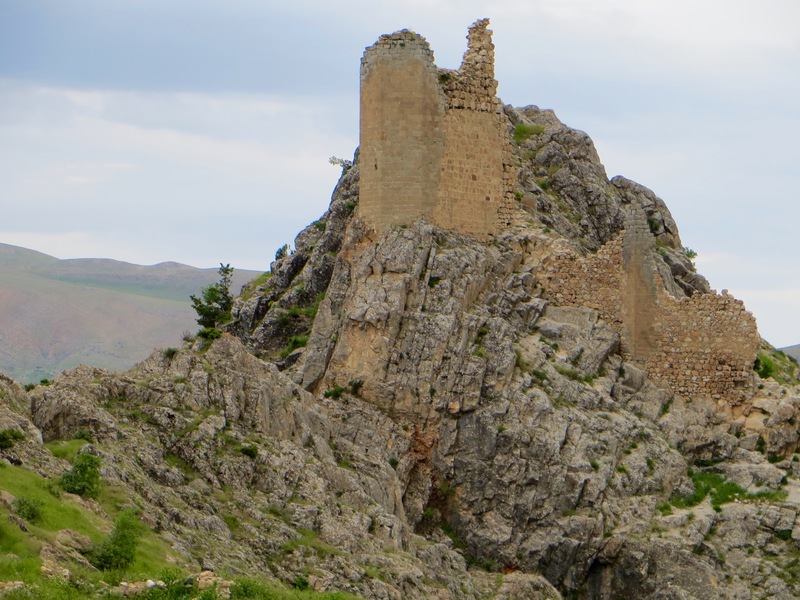 It is reminiscent of that of the castle of Pertek. The two walls are built above vertical cliffs. 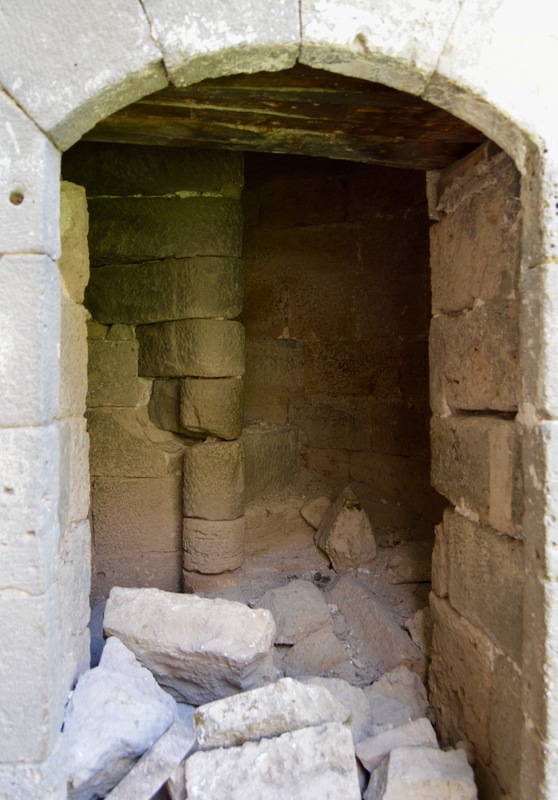 The extent and configuration of the rest of the castle has not been investigated. ? 16th century, but certainly the reconstruction of a previous castle. 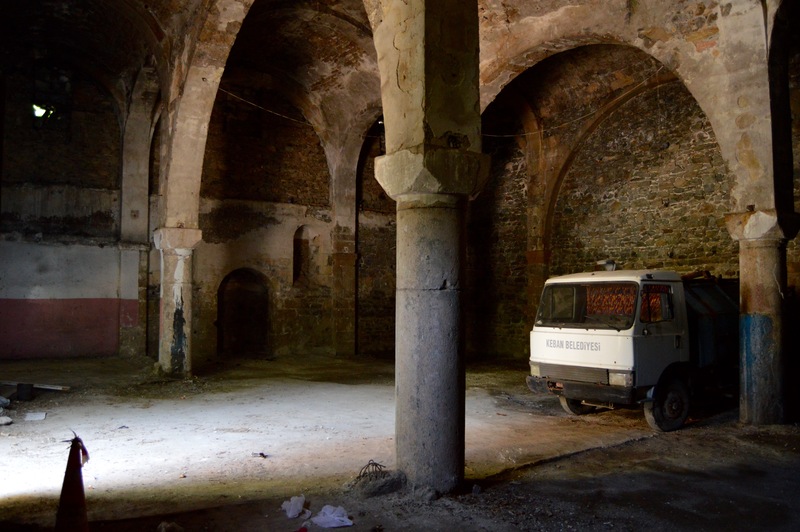 Just north of the mosque is a cesme with two vaulted bays. 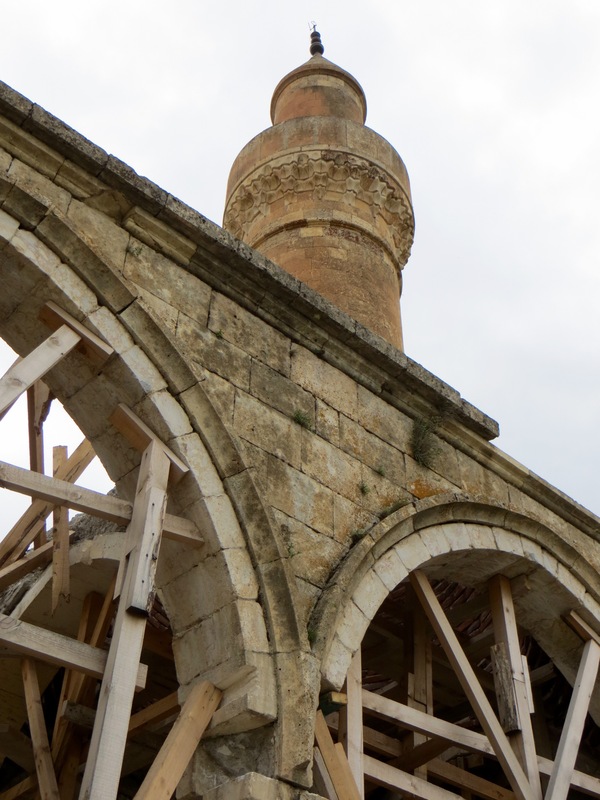 The cesme was built in 1555 by a local Kurdish ruler called Bey Keykusrav, who may have also built the mosque itself. 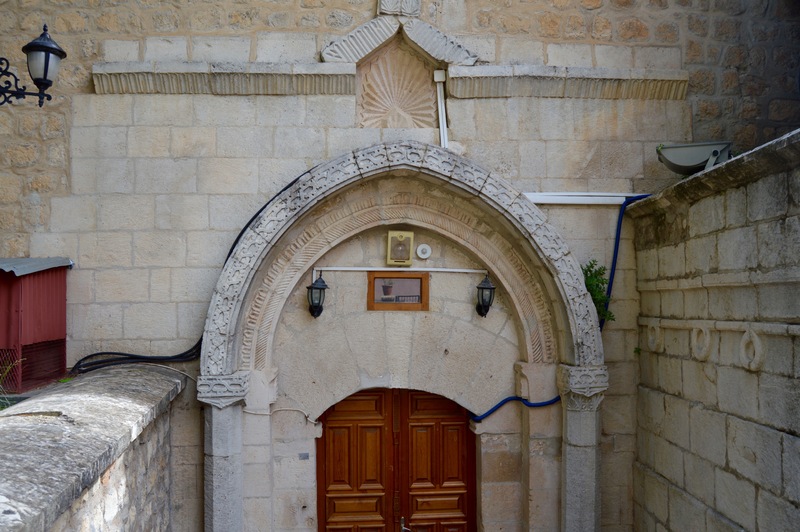 Bey Keykusrav was the father of Salih, the prince who is buried in the turbe. 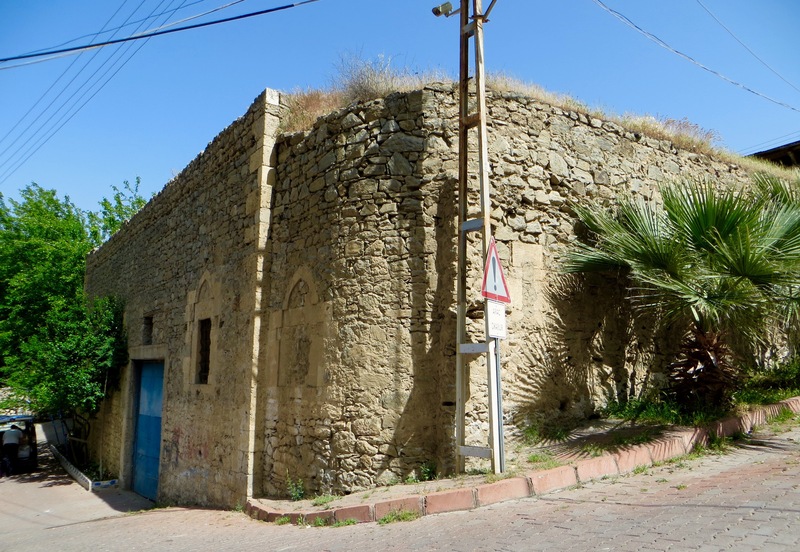 It was on land between the castle and the mosque, but a little to the north of the former, that, until the 1980s, a cluster of houses marked where at least part of the old town of Sagman stood. Today, however, only traces of the foundations of the houses remain among trees and undergrowth of recent pedigree. Half way through my look around, I met two elderly couples who had driven to this quiet but beautiful spot to eat a picnic and walk along paths disappearing as the grass and flowers took over. Both couples appeared to be Sunni Muslim, but I could not fault their friendliness. I was asked to eat some food, but declined the invitation because it was now about 4.00pm and I was not sure how long it would take to get back to Pertek. 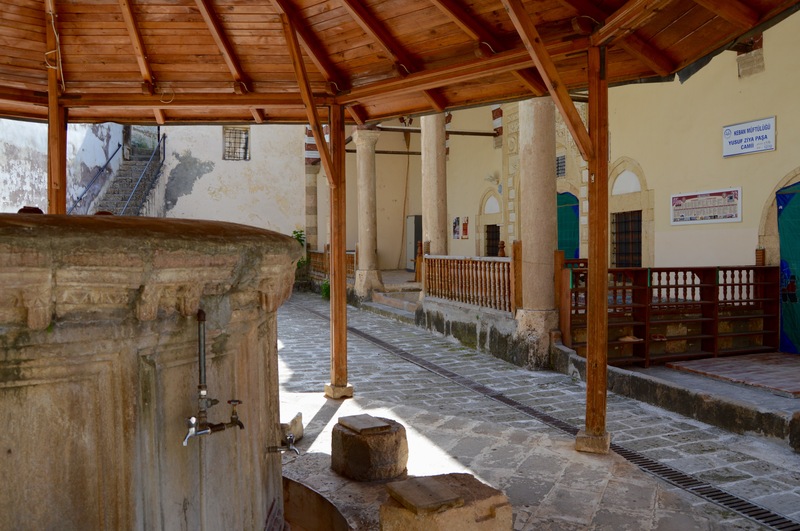 I continued to chat with the two men as I drank water from the cesme. I had seen on arrival an old dirt road leading from beside the mosque into the valley to the south and asked the men where it went. 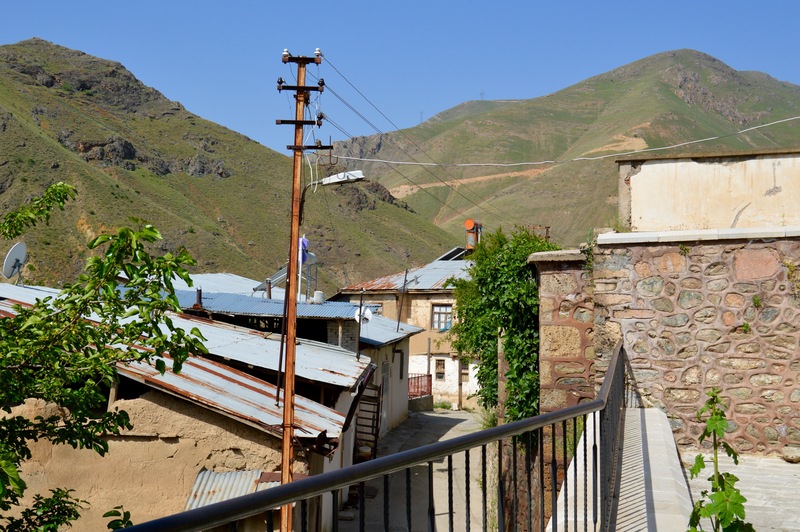 They explained that it was the old road from Pertek which, for the last 5 or 6 kilometres, is no longer used by motor vehicles destined for Sagman because it has not been maintained for many years. 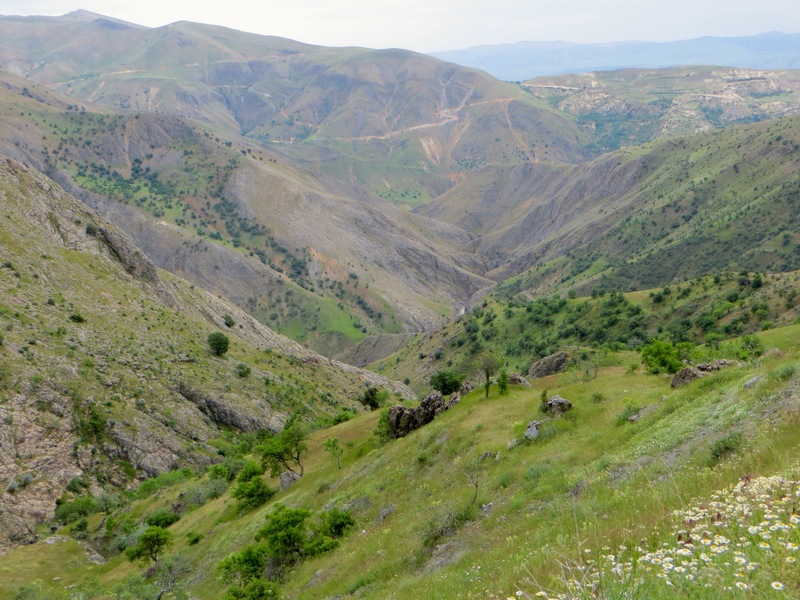 Nonetheless, it could be walked and, from where the road is still accessible to motor vehicles, that is, from a very small, largely deserted village one of the men identified as a mahalle, I might be lucky and find a private car going to Pertek. 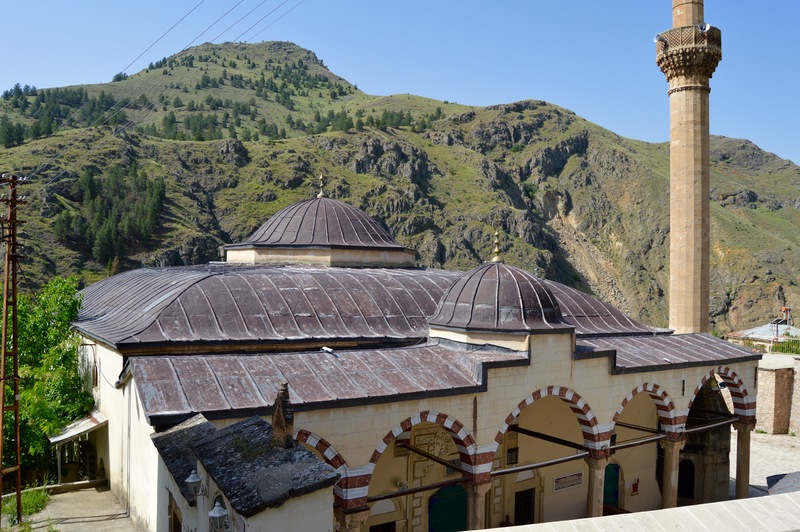 When it was suggested that Pertek lay about 12 to 14 kilometres from the mosque, I thought the walk would be worth the gamble. To return the way I had come might involve a walk just as long, but still leave me about 8 to 10 kilometres from the hotel. 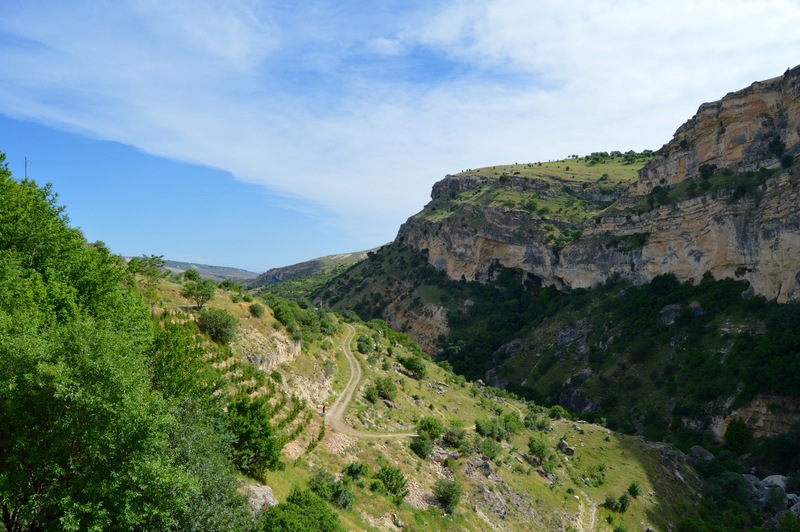 I was told to take a left just before the mahalle, the first settlement after leaving the mosque, and warned that I would have to first descend to the river before ascending the other valley wall and taking a right to Pertek. 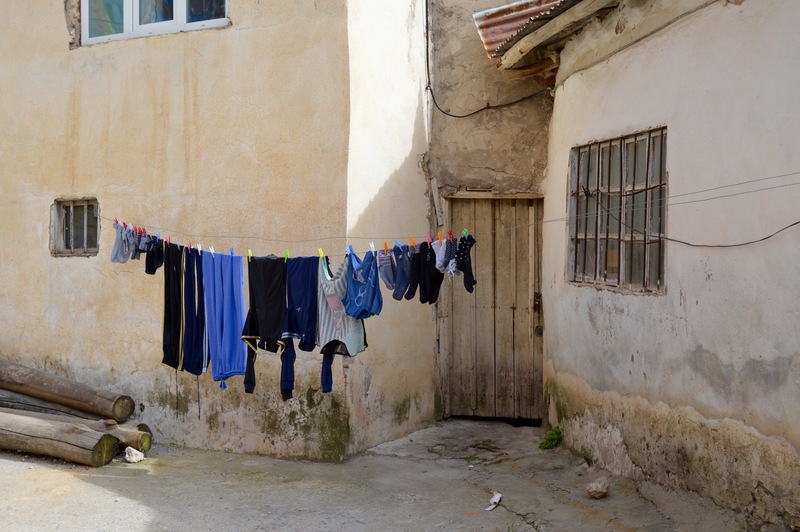 By now, a little rested and with a bottle full of water from the cesme, I was keen to press on. 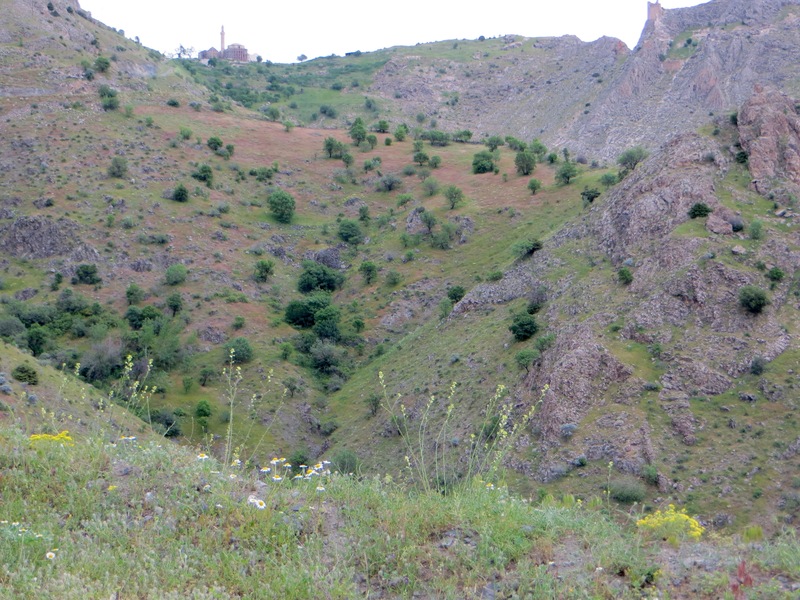 If nothing else I would see yet more of the uplands of Dersim that had so captivated my imagination. 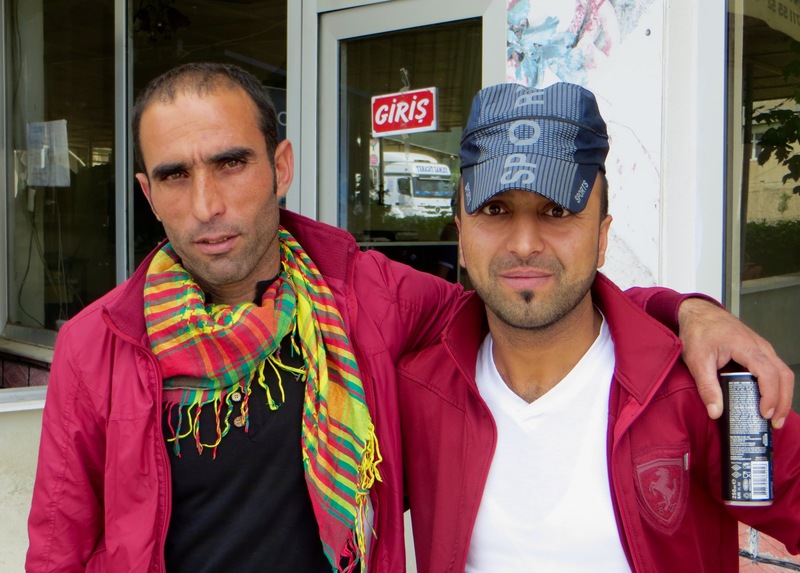 I shook hands with the two men who said I should arrive in about two hours at an inhabited village 2 or 3 kilometres from Pertek. By now the cloud had built up again and I set off at a brisk pace knowing the cooler conditions would militate against getting overheated. I kept turning back because the views of the castle were particularly good, but there were also moments when the mosque was silhouetted against the grey sky. The valley into which I rapidly descended could not be faulted either and, the lower I got, the more I encountered trees and undergrowth. When I looked up mountains enclosed me. I felt elated all over again. I arrived at a left turn but, to confirm it was the correct one, walked a little further to ensure the village lay nearby. It did lie nearby and, at the point where the road came to an end, someone had parked a very old car. This implied that at least one house in the village must still be lived in, but, when I looked around, most of the narrow paths leading from one house to another were overgrown or breaking up. 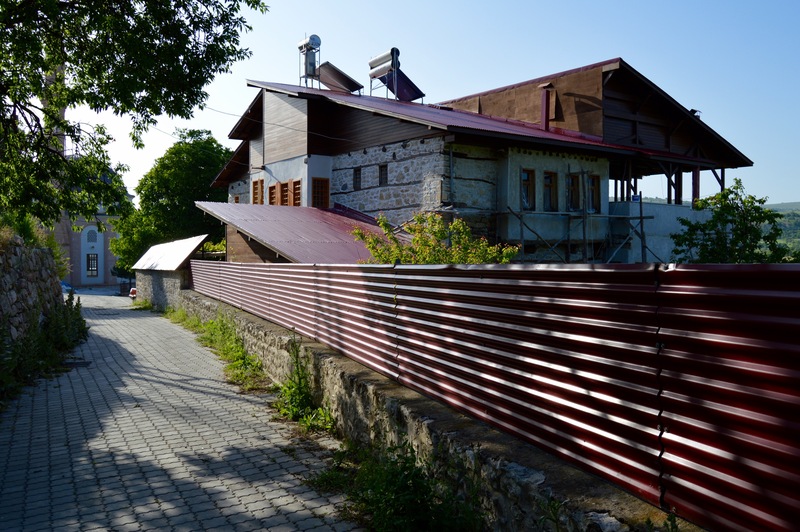 The houses had been built on the steep, south-facing slope in such a way that no house obscured the view of another. The houses utilised a light brown stone and had flat roofs, but not one appeared to be inhabited. 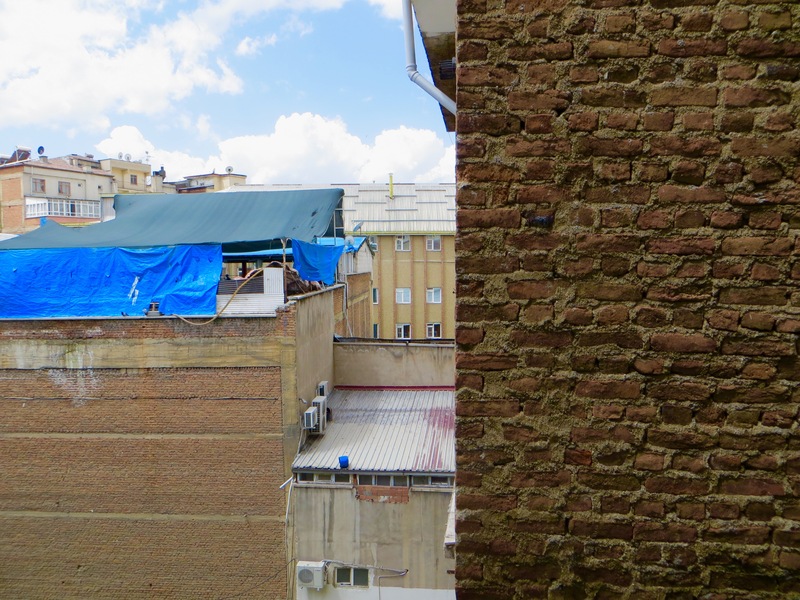 Some roofs had been covered with large blue tarpaulin sheets weighed down with stones. The tarpaulin sheets were no doubt intended to keep the rain from penetrating inside, which made me think the owners of the houses had plans to restore them, perhaps so they could use them during the summer months. I looked around and could not think of many more pretty places to have a house. Moreover, it was from the village that the road could be driven along, albeit with care in places. 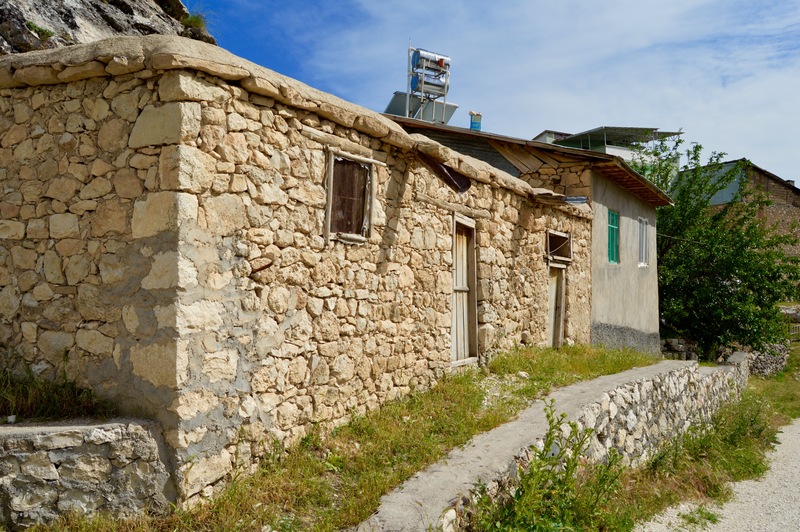 The almost deserted village between Sagman and Pertek. 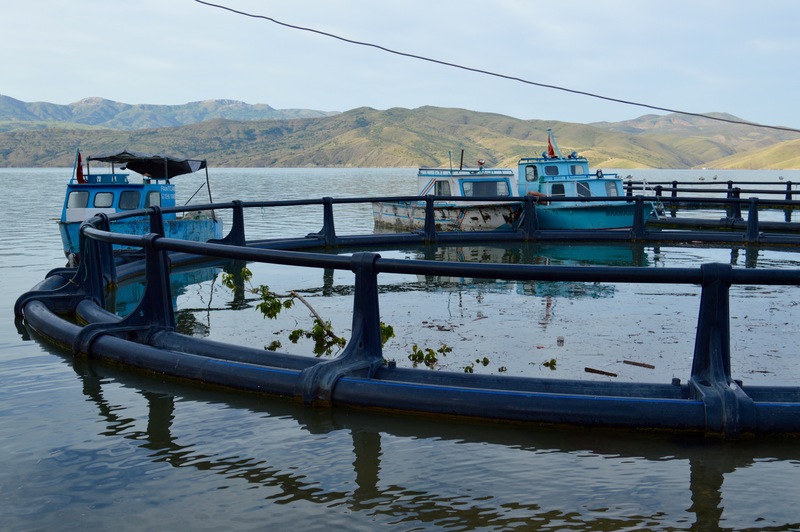 By now the wind was building up and, about half a kilometre from the village, rain began to fall from a sky full of grey cloud, thunder and lightning. Luckily I had my anorak so I put it on and zipped it up. The rain persisted for about half an hour, but I pushed on because shelter beside the road did not exist. During that half hour I passed two very large flocks of sheep being brought down from the pasture on the mountain slopes and chatted with two young shepherds smoking cigarettes under an umbrella. The young shepherds alarmed me when they said that Pertek was still 10 kilometres away (luckily, they were wrong). I then arrived at the point where a bridge crosses the river. A steep ascent out of the valley lay ahead, which I knew would test my increasingly tired legs, but I was now about half the way to my destination. As the rain eased and then stopped altogether, I saw that nomads had set up a camp not far from the bridge on a patch of level ground wider than anywhere else nearby. The shepherds I had spoken with earlier would no doubt spend the night in one of the tents. Their sheep would be put into pens assembled from wooden fencing. An open-topped lorry had been parked nearby. The lorry had been used to bring the tents and other camp equipment a few days or weeks before. The clouds began to break up and the sun shone in a sky that grew steadily more blue with every minute that passed. 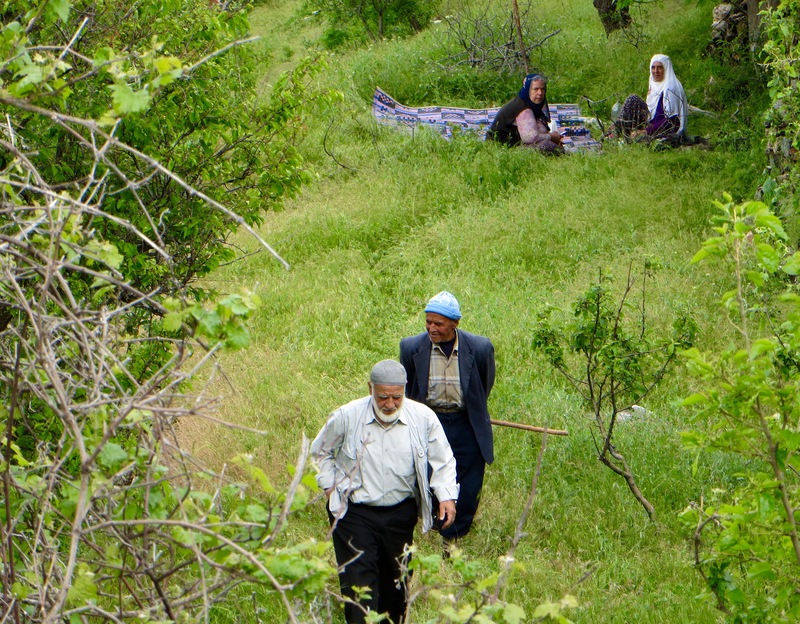 Although I had to walk all the way to the inhabited village the old men had mentioned, the scenery was so enchanting that I could not help smiling, my tiredness notwithstanding. I was now very high on the north-facing valley wall and could see for considerable distances in every direction except south where the reservoir was. 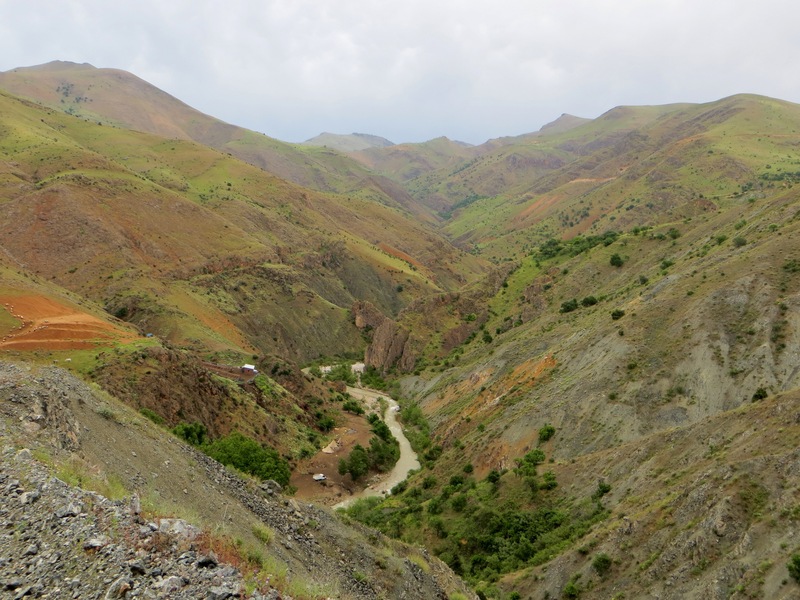 However, east, north and west there were hills, mountains, deep valleys, a meandering river, large flocks of sheep and goats, trees on the steep slopes and, an indicator that the village was nearby, lots of beehives on a relatively flat shelf high above the river. Moreover, ahead was a break in the ridge immediately to the south that would allow a road to turn right for Pertek. I had just about done it. As I approached the gap in the ridge, I saw a woman aged about thirty-five sitting on a rock as she smoked a cigarette. She was not wearing a headscarf. 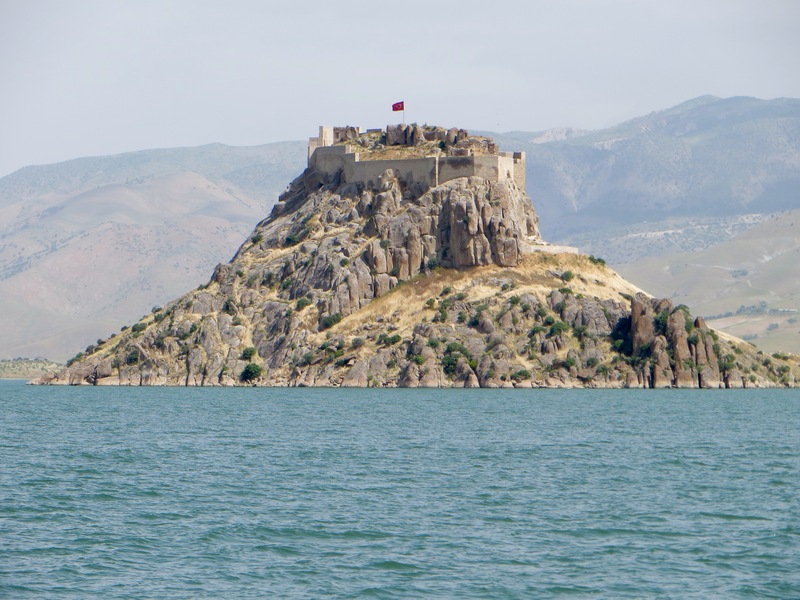 She looked north toward the highest mountains of Dersim. With the ascent over I needed a break, so I said hello and, when the woman replied in a friendly manner and patted the rock on which she sat, I knew she would not object if I rested beside her. We shook hands and I declined a cigarette, but I drank lots of the water in my bottle. The water had remained almost as cool as when I had taken it from the cesme at old Sagman. It turned out that one of the old men at Sagman had rung someone in the village to look out for my arrival and the young woman with whom I was chatting had decided to assume the role of welcoming committee. She was a jandarma enjoying a few day’s leave and had returned to her home village to spend time with family and friends. A female jandarma? 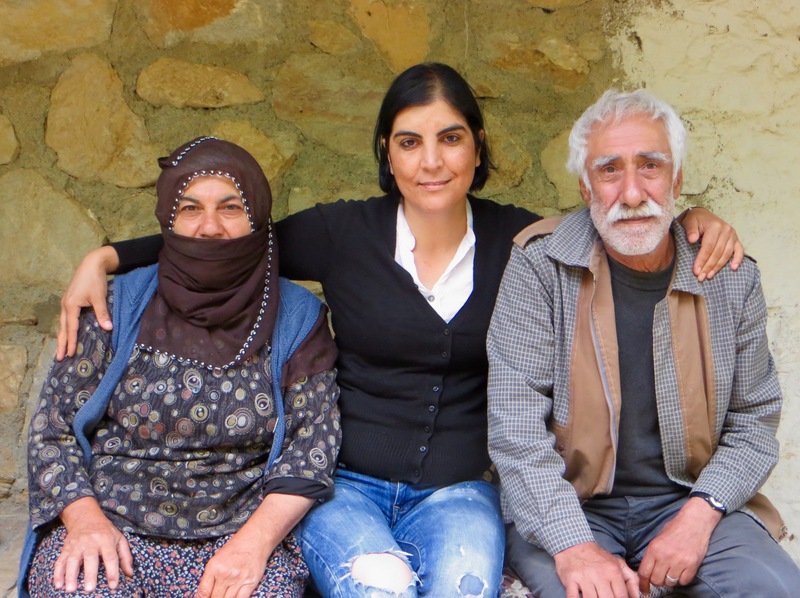 This was most unusual in itself, but when she said she was Alevi and unmarried (very few women in Turkey remain unmarried by the time they are thirty), my surprise was compounded. However, she had a great sense of humour and was determined that I would meet her mother and a few other people in the village. I was led to the mother’s house, an old place spread over a single storey, and encouraged to sit in the small garden in shade created by vegetation trained overhead. After the mother had been introduced to me and before she sat down to join in the conversation, she brought me some stuffed vine leaves, a stuffed pepper and two large glasses of fruit juice, all of which I consumed gratefully because I had had nothing since breakfast except water. The mother and daughter confessed to finding Sunni Muslims “a problem”, and the daughter confessed to enjoying alcohol when she was off-duty. I explained about the organic wine I had been given at Onar and the daughter laughed heartily, just as she had laughed earlier, when, after I had peeled off my anorak to reveal a damp shirt unfit for human wear, I tried to make myself look more presentable by combing my hair! Her laugh said it all: my effort was a total waste of time. 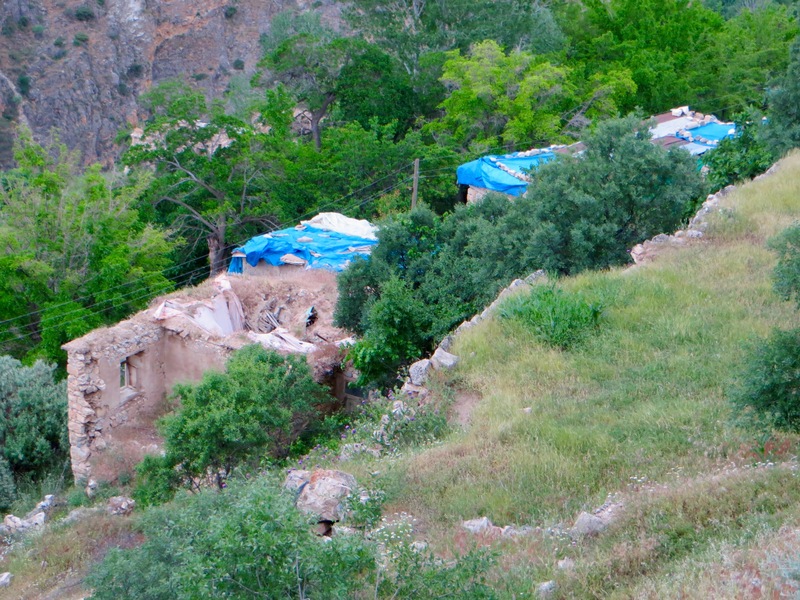 The village where I was fed between Sagman and Pertek. 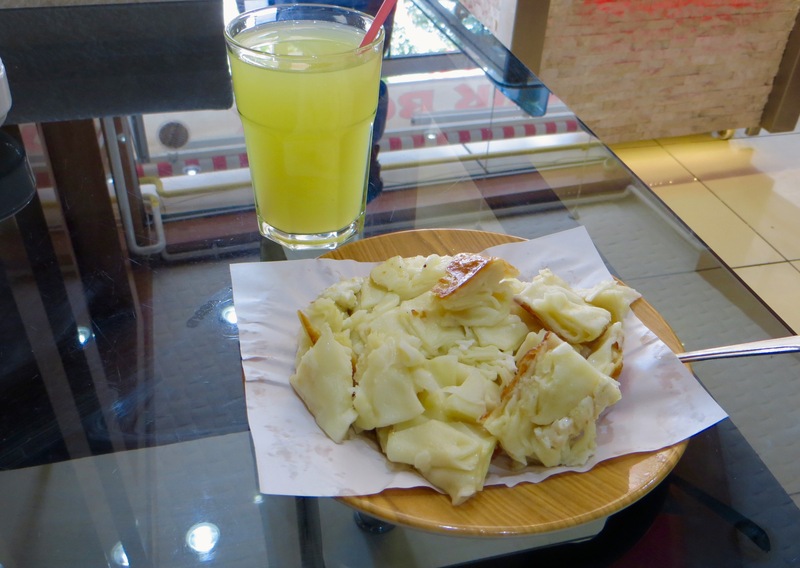 My meal over, I explained that I had to get to Pertek before nightfall, something I was told would be no problem because it was only 2 or 3 kilometres away. The daughter took me for a short walk through the village where I met a few more people, then we kissed on the cheeks and I set off for Pertek. The road soon provided excellent views over the town and the reservoir. Because I was descending all the time less effort was required, and, once on the edge of Pertek itself, I took a short cut across some derelict land on which had been built the occasional house or small apartment block. I emerged on the main road leading to Cemisgezek and Hozat, but the roundabout with the peace sign still lay about 3 kilometres away. So near yet so far from my destination. It was now that the fatigue really kicked in because there was nothing new to enjoy (although, walking toward the hotel a little later, there was another dramatic sunset). I called at the same bufe as the night before to buy two beers and a packet of crisps, which was all my body craved because of the excellent food so recently consumed, then I took a few photos of the sunset. I lingered a while to chat with the hotel staff on reception because they looked bored, but was in my room by 7.45pm, just as the last light was draining from the sky. 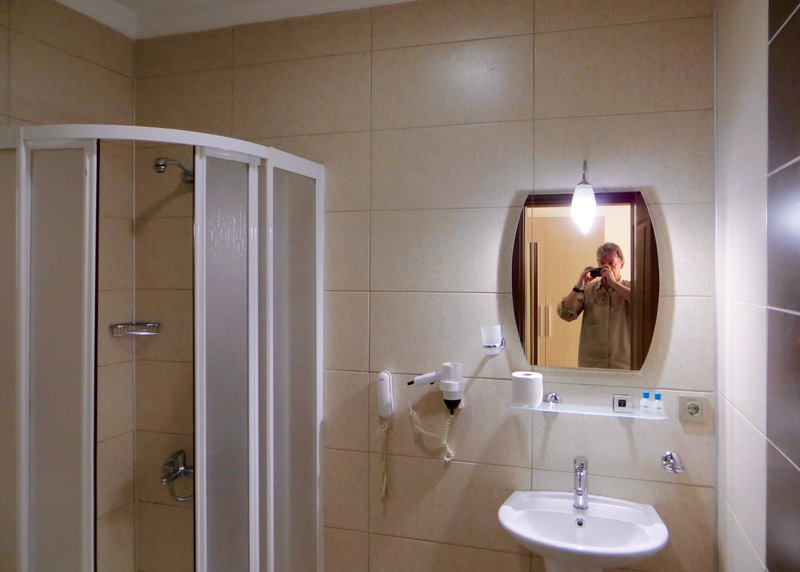 I stripped off, showered, put on the heavy towel dressing gown provided to every guest for the duration of their stay and washed a few items of clothing. 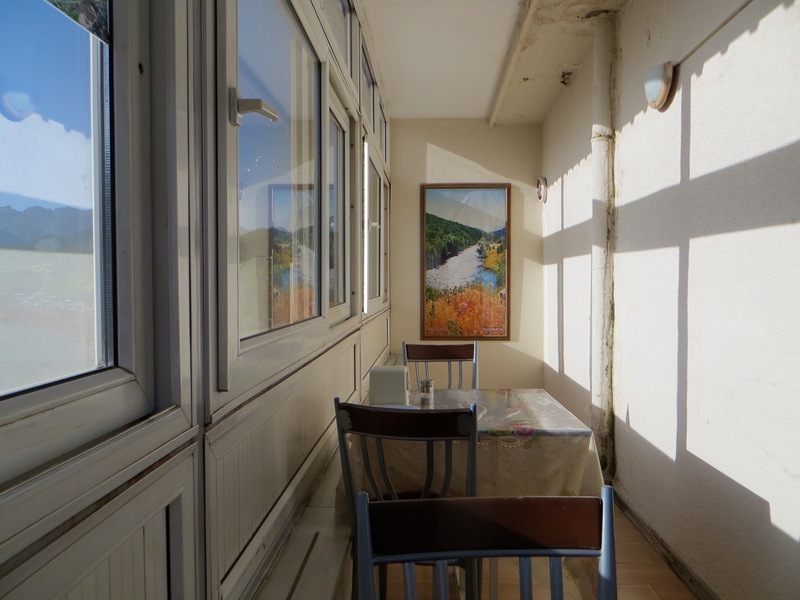 Next, I sat at the table in front of the window, opened the first of the two beers and began jotting down a summary of what had happened since waking that morning. Not all today’s monuments had lived up to expectation, and many houses I had hoped to see no longer existed, but the scenery had been memorable from start to finish. 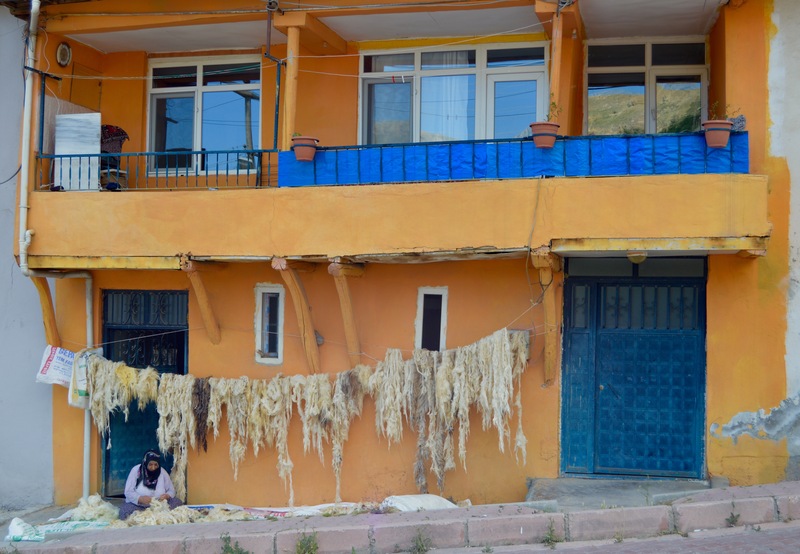 I had walked 25 to 30 kilometres through some of Turkey’s most enchanting upland scenery and been driven through even more of it, and, as a consequence, felt confident I would return quite soon to delve a little deeper into what Dersim has to offer. To Cemisgezek and the Termal Hotel. Because of being dropped off where hills, a river, trees, pasture, wild flowers and lots of beehives presented an image of rural bliss, I decided to wait until a lift arrived and, after only twenty minutes, a small open-topped lorry drew to a halt. The driver already had two men in the cab and on the back of the lorry were two cows. I was lucky: the men and their cattle were going to Cemisgezek. The two passengers shuffled along to make room for me and, just over an hour later, we arrived at our destination. 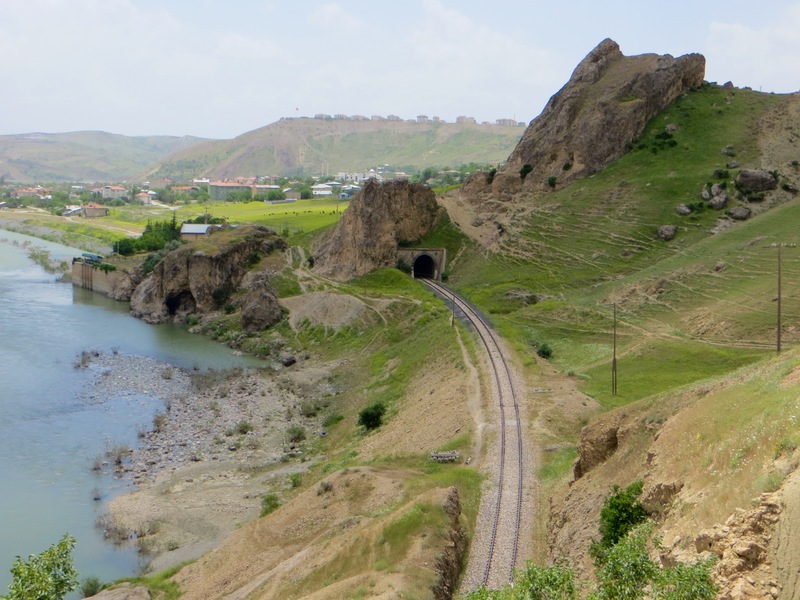 While the driver said almost nothing the whole journey other than to reassure me that my presence was not a problem, the two passengers chattered incessantly in Zazaki, a language that I understand even less well than Kurmanji. I got the feeling they were gossiping about people they knew and about whether such people could be trusted when transacting business, because every so often sums of money were mentioned. The journeys to and from Hozat and to and from the Armenian church had been remarkable, not least because the roads along which I travelled were usually high up so the views were extensive, but I think I enjoyed even more the journey to and from the junction where the lorry picked me up. When meandering along the valley floor, not once were we confined by a narrow gorge. Along the rivers, the trees and small fields provided intimate counterpoint to the grandeur of the upland surroundings. However, a lot of time was spent high among rounded hills. 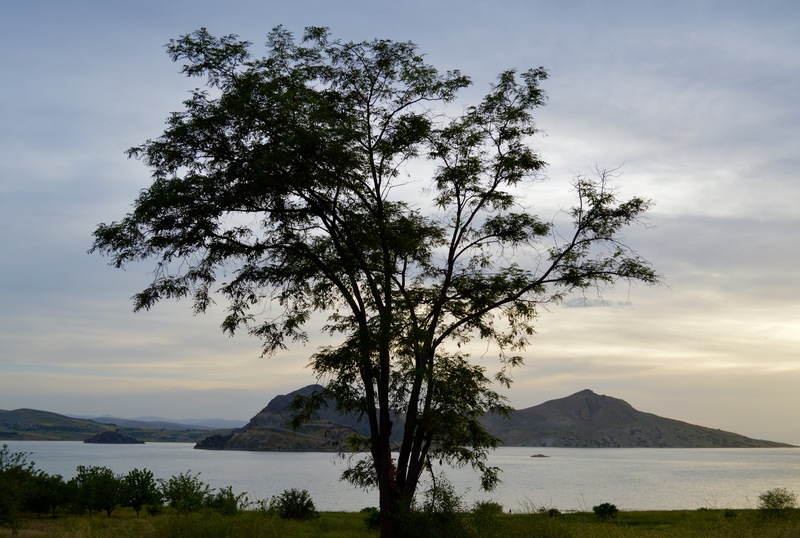 The views were uninterrupted and took in distant mountains and the Keban Reservoir. Along the road and in the middle distance pasture was everywhere, in some instances covering the summits of the hills and mountains themselves, but the pasture was not quite as good as further north and east. Consequently, sheep and goats were much more numerous than cattle and the flocks were in some instances enormous. After about 40 kilometres of stunning upland scenery we arrived in the centre of Cemisgezek, which itself lies above a river in a deep gorge with cliffs and mountains around it. 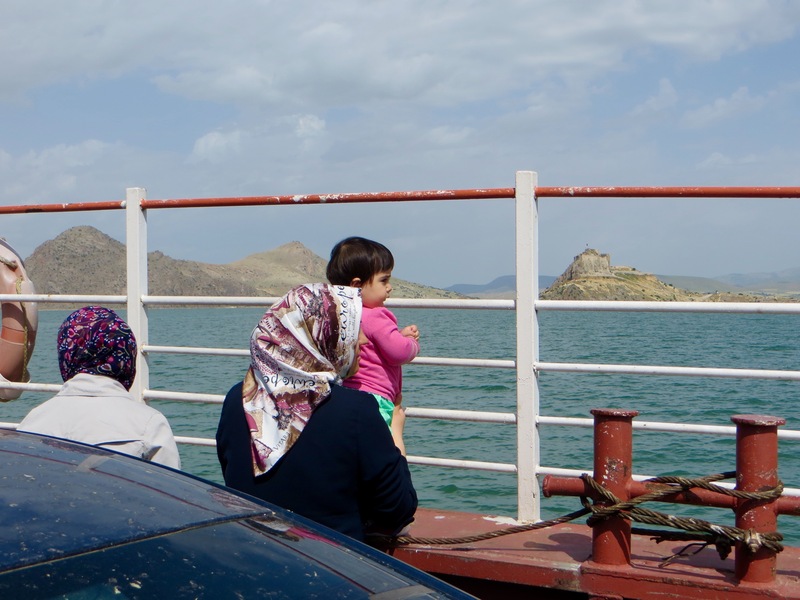 By now it was 3.00pm and, when I explained that I had to return to Pertek that evening, the driver and his two companions expressed some alarm because minibuses did not travel the whole distance, only to the ferry a few kilometres to the south-east to take a short cut to Elazig. 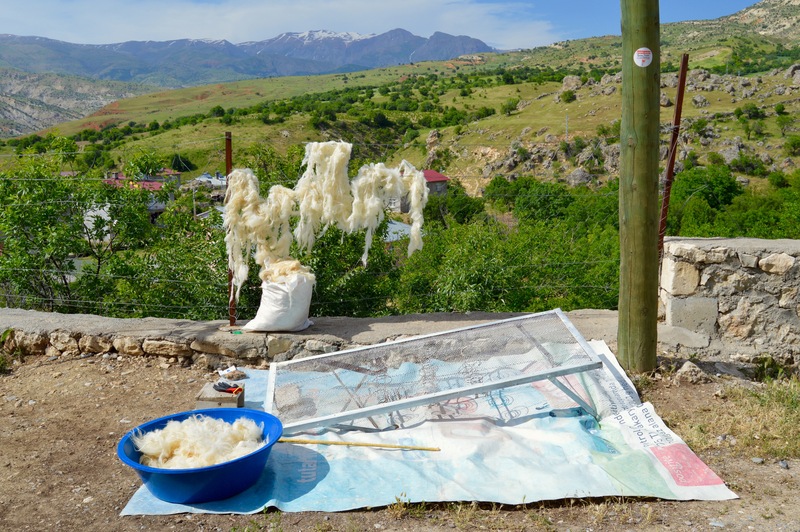 I felt confident I could hitch to my destination, however, but, to increase the chances of getting to Pertek before nightfall, decided that I would try to confine a look around the town to just over an hour. 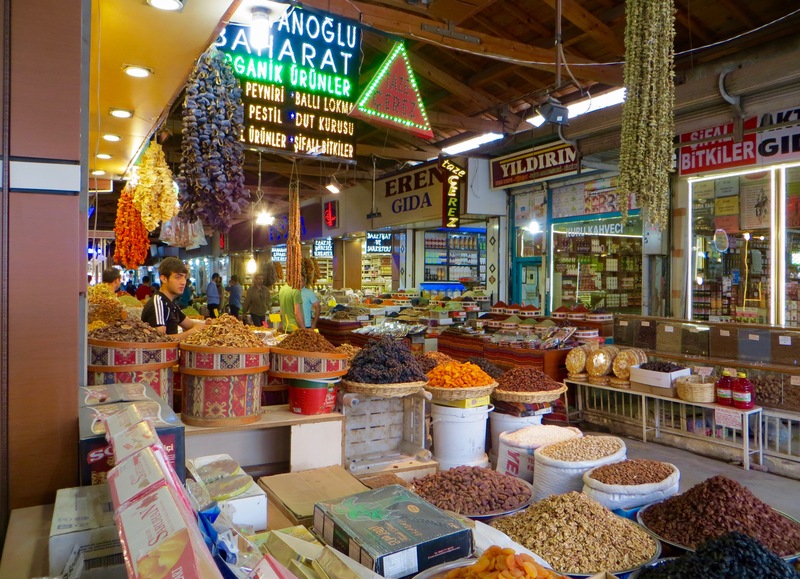 Cemisgezek is large enough to have a vibrant commercial heart and a small pazar, the latter largely confined to a narrow street devoid of motorised traffic. 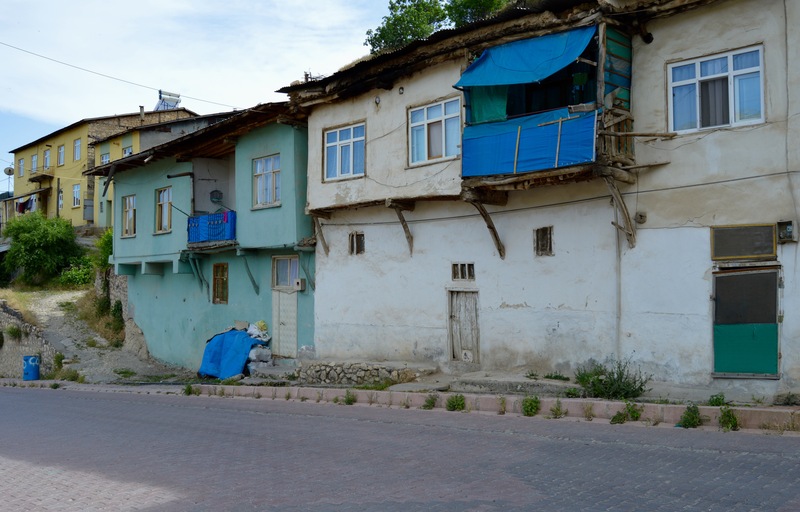 Although modern structures of limited architectural merit outnumber old buildings, enough old buildings, most of which are houses, survive to make the town a detour well worth undertaking (day trips from Elazig should be considered, given that minibuses run most of the day. Cemisgezek does not seem to have a hotel worth staying in). Although some tooth-like rocks and a few traces of masonry reveal where the castle used to be high above the river in its gorge, other monuments from the past are of greater interest. 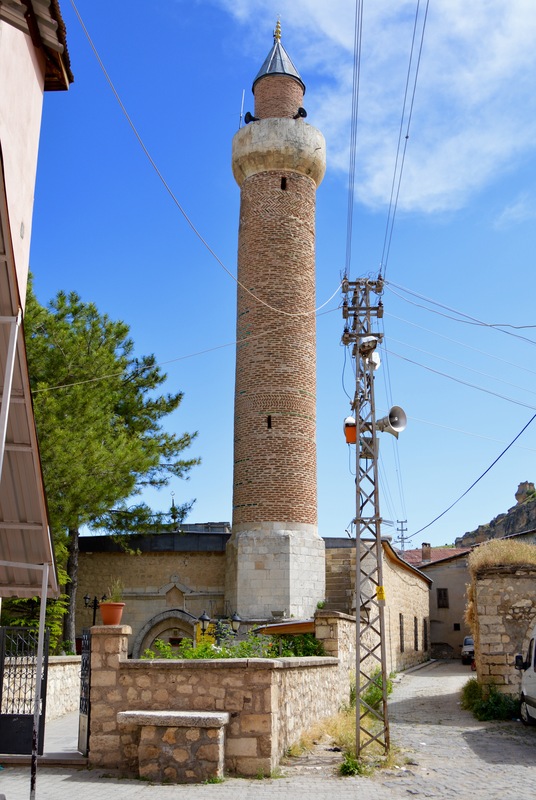 Yelmaniye Camii dates from 1400 (it has a portal with interesting carved ornamentation and a bright and attractive interior with a mihrab with a deep niche) and Suleymaniye Camii has a very impressive minaret from the Selcuk period. 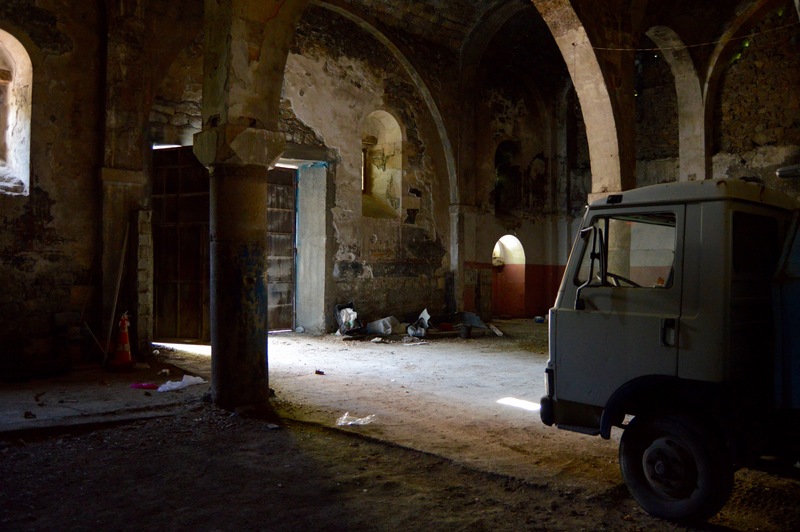 The town centre also has two hamams, and a turbe and a bridge with a single pointed arch are in the nearby countryside. 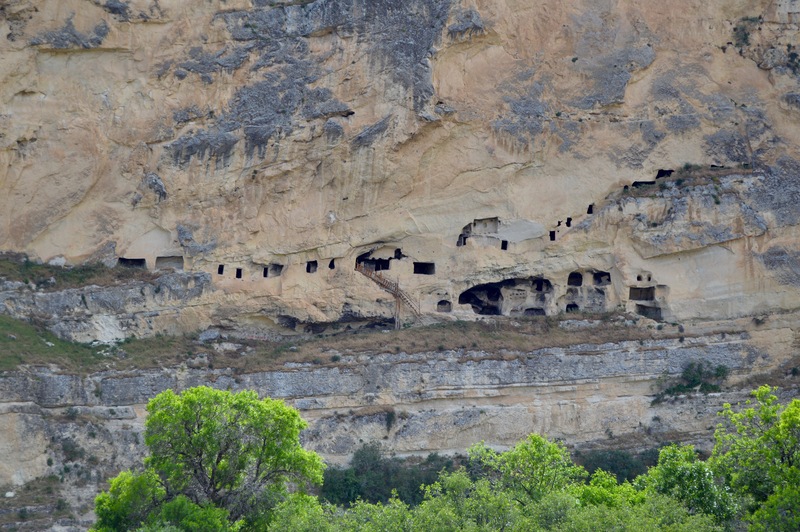 Overlooking the town from the west are some caves in a cliff. One of the caves has some Armenian graffiti which Sinclair dates to the late 19th century. 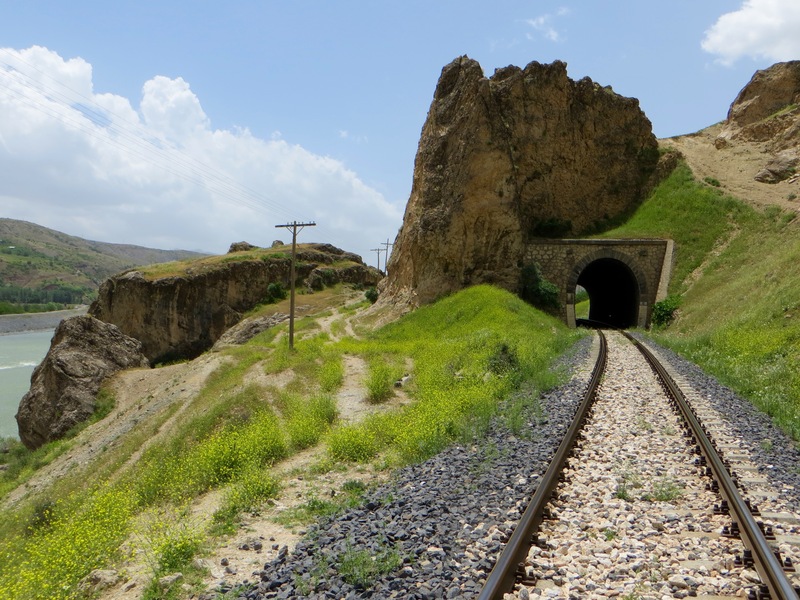 Sinclair also says that the caves were lived in until 1938 by Alevi Kurds who took part in “the Dersim revolt”. 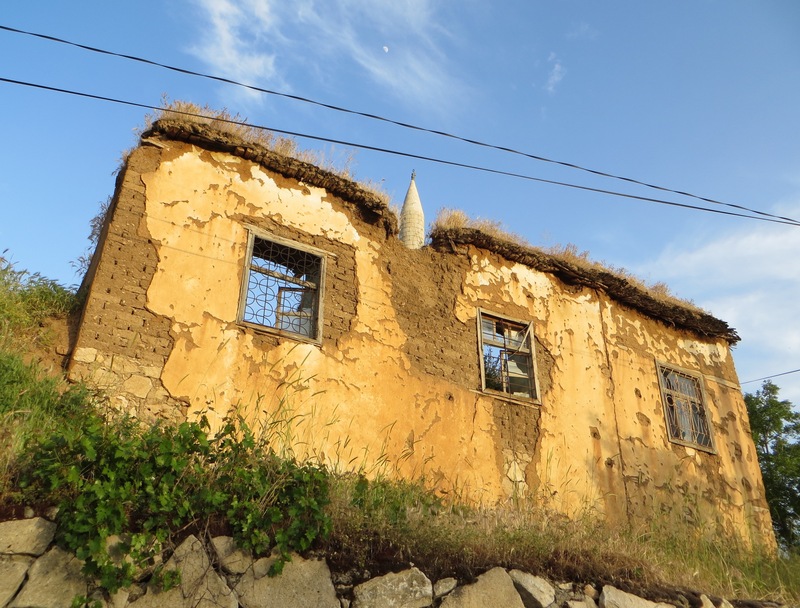 After a general pardon for prisoners, the Alevi Kurds who remained alive were given yaylas behind Yilan Dagi (“further up the valley of the Cemisgezek Su”) and “enough money to buy flocks, even to build houses”. While it would be fair to say that all the monuments just listed make a detour to Cemisgezek worthwhile, the old houses are the town’s most remarkable feature (this said, the town seems to be predominantly Alevi and everyone is very friendly, so this is another reason to visit a settlement a little off the beaten track). Many of the old houses survive as two-storey terraces along cobbled streets. 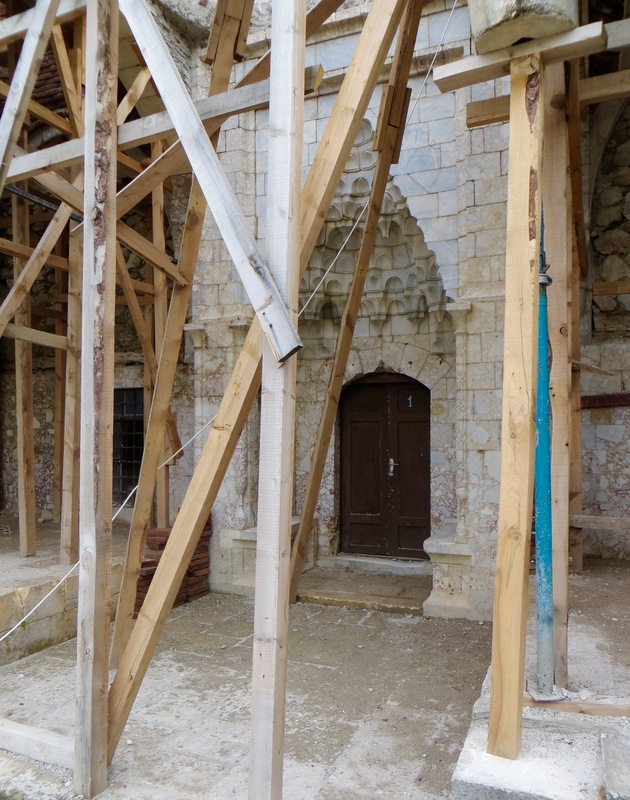 The houses are timber-framed and the mudbrick walls encased in plaster. People like to paint the walls a rich variety of colours, some of which have attractive shades reminiscent of pastel crayons and ice cream. 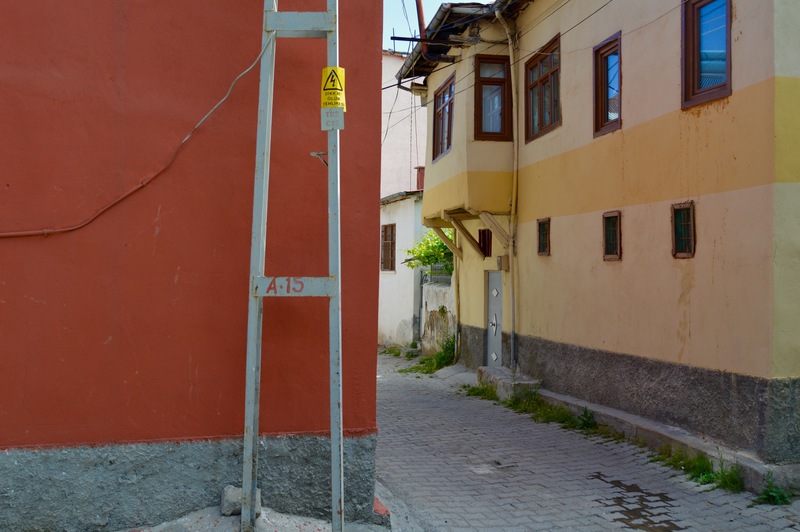 The narrower streets are overhung by the balconies of the upper storeys and in some streets the ground floors are a little below the level of the road. I asked someone where the cemevi was located and was directed through the commercial heart of the town and onto a road leading to the north, which ascended into an area that quickly becomes overwhelmingly residential. In this area some old stone houses survive, some of which spread over only one storey. I asked a woman for further directions and was urged to look down into a depression more or less constituting the northern extremity of Cemisgezek. I looked over a wall and there lay a modern cemevi among some of the town’s newest houses. 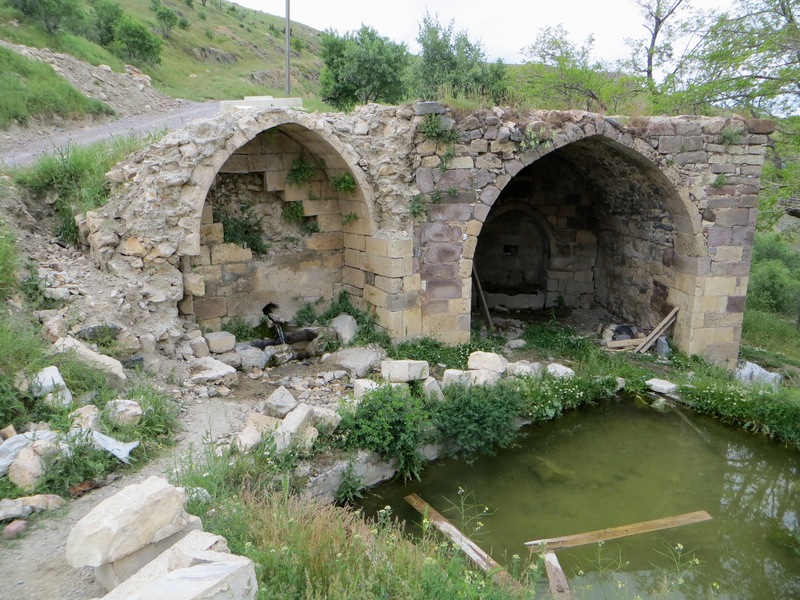 I was told it is called Kirklar Cemevi, or Forty Cemevi. For Alevis and Bektashis, the number forty has special meaning. For some Alevis and Bektashis it refers to the forty “saints” Muhammad is said to have encountered during his nocturnal ascent to heaven/paradise, and for others it refers to the forty levels that constitute in far greater detail the four gates, or major life stages, that make up the Alevi and the Bektashi spiritual path (this path is usually identified by the Turkish word “yol”, a word commonly translated to mean “road”). Because Cemisgezek has so much to enjoy I stayed considerably longer than an hour. Just as I set off to walk out of town to find somewhere from where to hitch a lift, I was stopped by three young women, all second year university students. We chatted a while and, although two of the women wore headscarves, photos had to be taken before I could resume my walk. 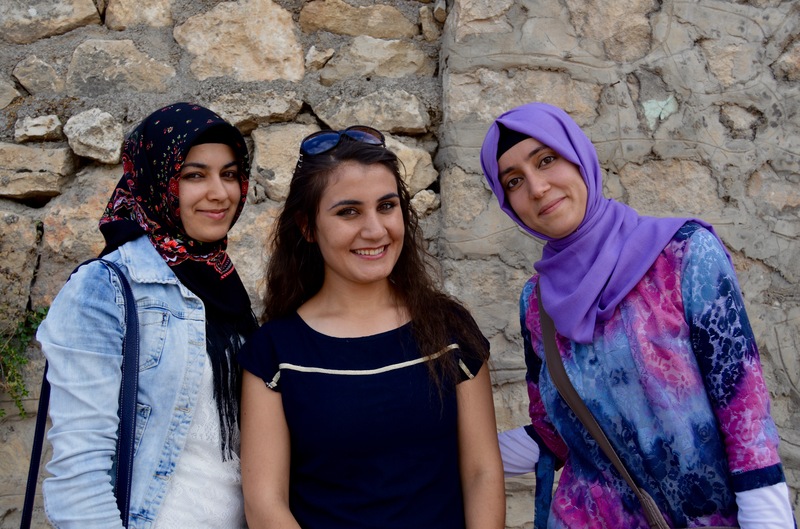 Here were yet more friendly people, in this case female, and two were conventionally pious Sunni women willing to risk criticism for chatting with an unknown male. 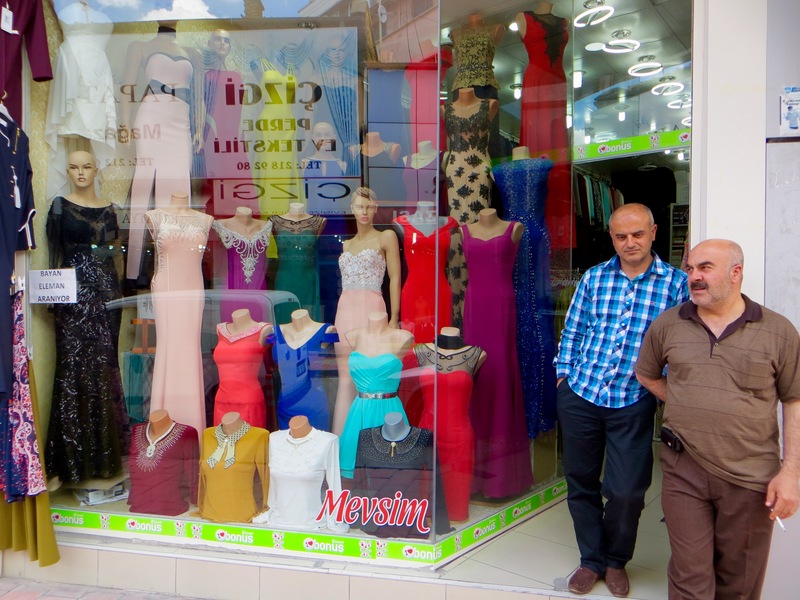 Mind you: Sunni women could get away with such unconventional behaviour in Dersim where gender equality and the empowerment of women are the norm. Such behaviour would be much less likely to manifest itself in Elazig or Erzincan. I had walked about a half kilometre out of town when a tractor stopped and the driver let me climb aboard for a lift of about 3 kilometres, which not only took me far beyond the last buildings of Cemisgezek, but also well into the delightful countryside to the south. 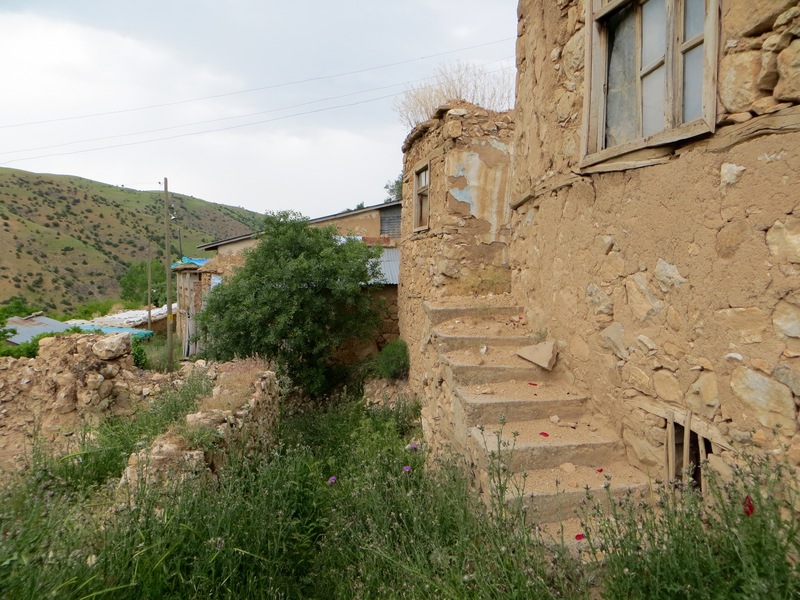 I stood beside the road and five minutes later a man drove me to the northern edge of Akcapinar, the first village from Cemisgezek. By now, of course, the sun was beginning its descent to the horizon so visibility was improving all the time. 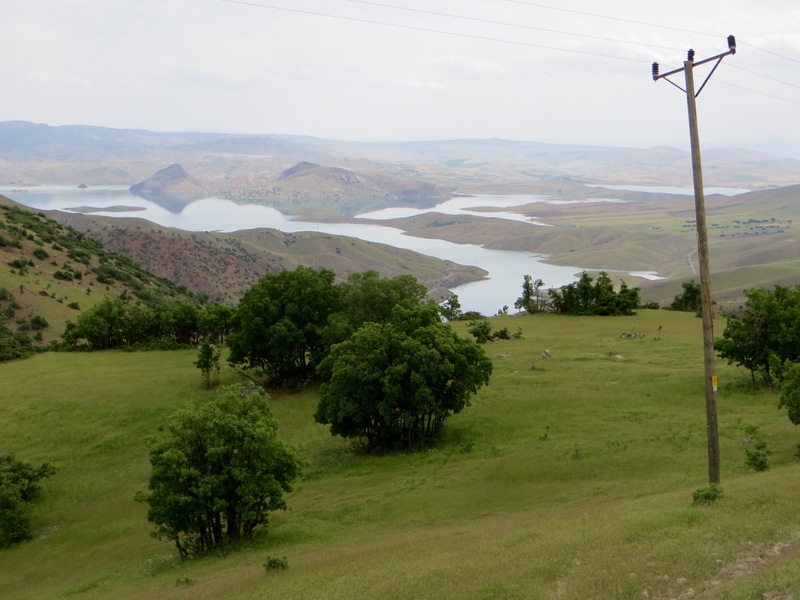 At the point I was dropped off I looked down toward Akcapinar across gently undulating fields and pasture, and beyond the fields and pasture was the Keban Reservoir with water a deeper blue than at any point during the day. Hills and mountains dominated the distance. No more than ten minutes later a lorry drew to a halt and who should be in the cab but exactly the same three men who had driven me to Cemisgezek earlier in the day! I was surprised to see that both cows were still on the back of the lorry, but it turned out they had simply been to Cemisgezek to undertake business that did not involve the livestock. Both cows were destined for one of the men’s small farms near Hozat. 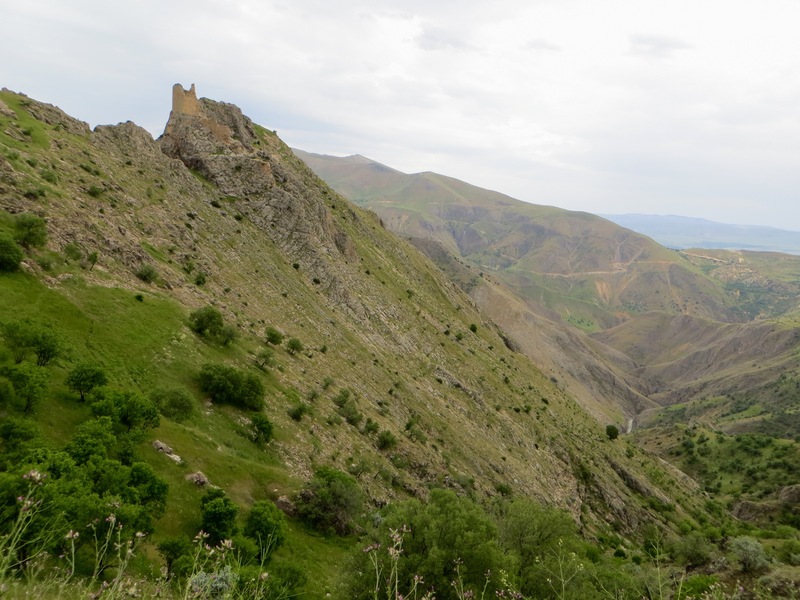 Because the sun was behind us and the visibility so good, the journey to the junction for Hozat was even more enchanting than it had been when we drove to Cemisgezek. I identified about a dozen places where I wanted to stop, sometimes to photograph the scenery alone and sometimes to photograph shepherds and their large flocks of sheep and goats in their natural surroundings. Some unusual farm buildings existed beside and not far from the road. When we finally arrived at the junction for Hozat, I wanted to give the driver some money for helping me fulfil most of the second part of the day’s programme, but he would not accept the notes in my hand. We were now friends even though we would probably never see each other again. 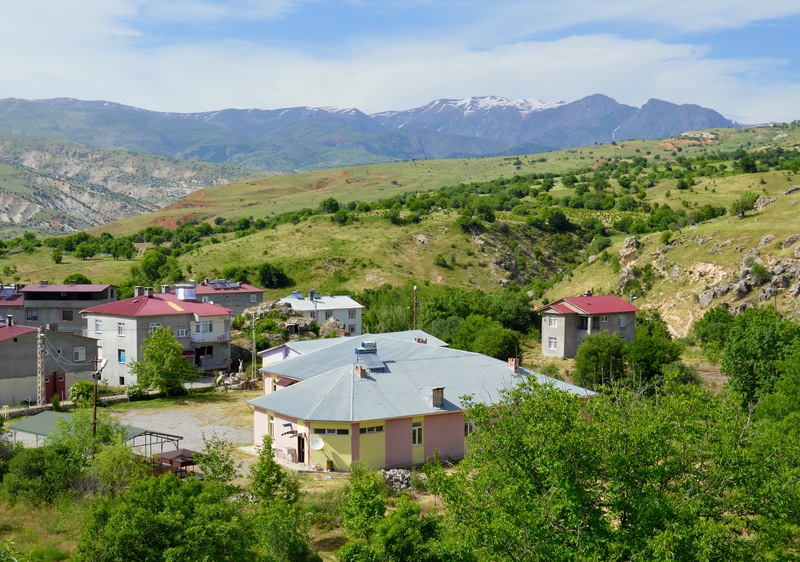 I walked a short way along the road toward Pertek, then saw to my right a small, ill-stocked supermarket occupying the ground floor of what was a large house or small apartment block. The building stood alone, but I could tell that the supermarket sold ice cream and beer. 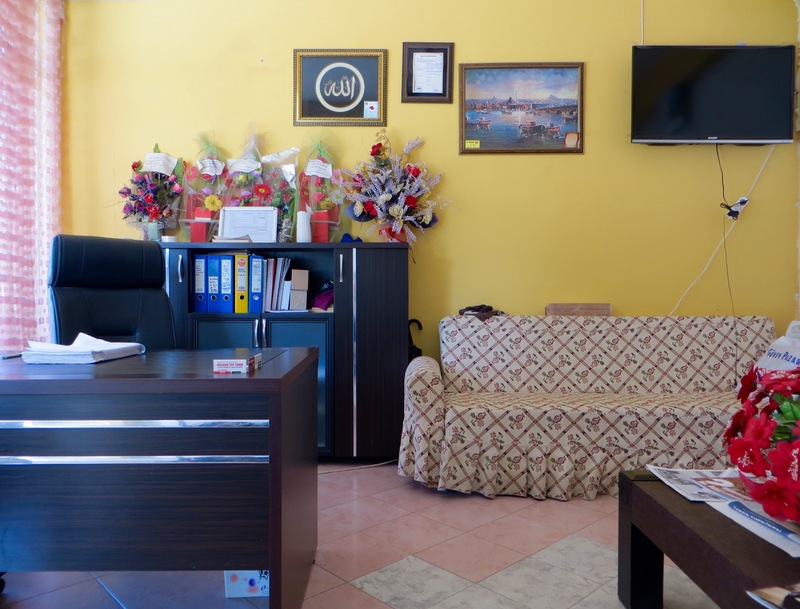 I called in for an ice cream and a chat with an Alevi male, the owner of the supermarket, who was a retired guestworker who had made his money in Germany. He told me he owned the building that contained the supermarket. 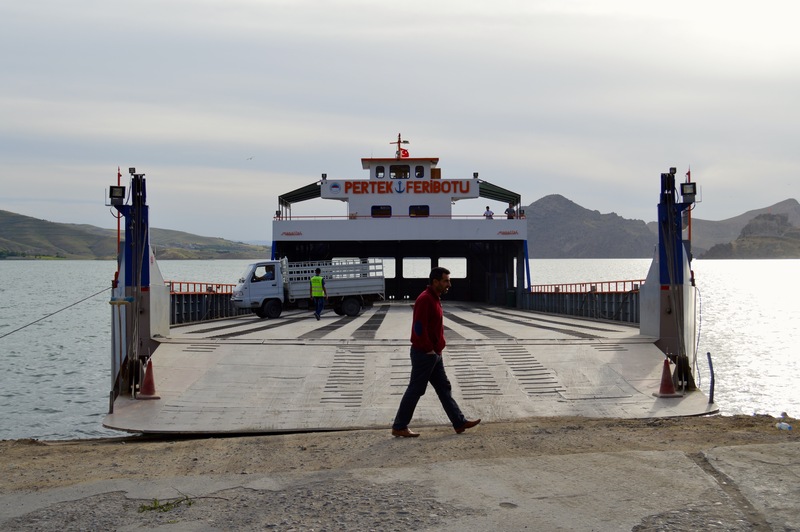 I walked a little further along the road, then a lorry stopped and the driver and his companion offered me a lift all the way to the ferry that departs from near the Termal Hotel. Once again the scenery through which we passed looked delightful, especially as it was now about 6.00pm and the shadows were lengthening. 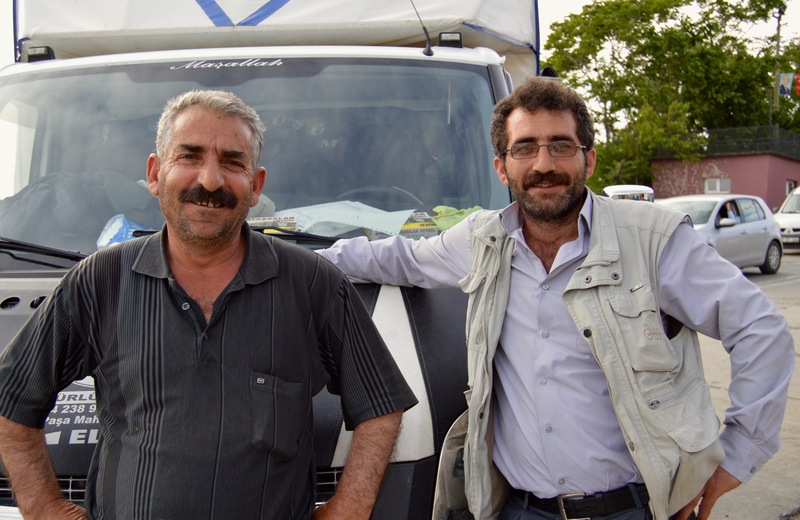 The two men in the cab were Kurdish Bektashis. 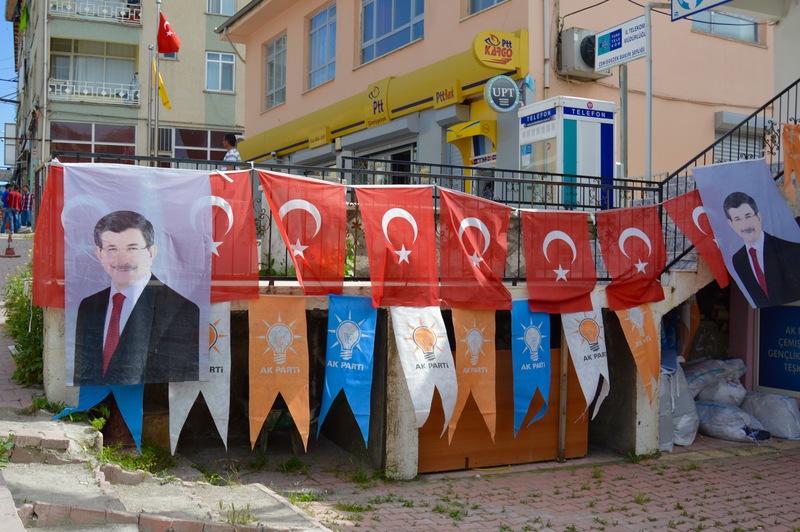 It did not take long before discussion about the forthcoming election shifted to criticism of the Sunni majority in Turkey that has always oppressed Alevis and Bektashis. One of the men grew unusually animated as he described past injustices. 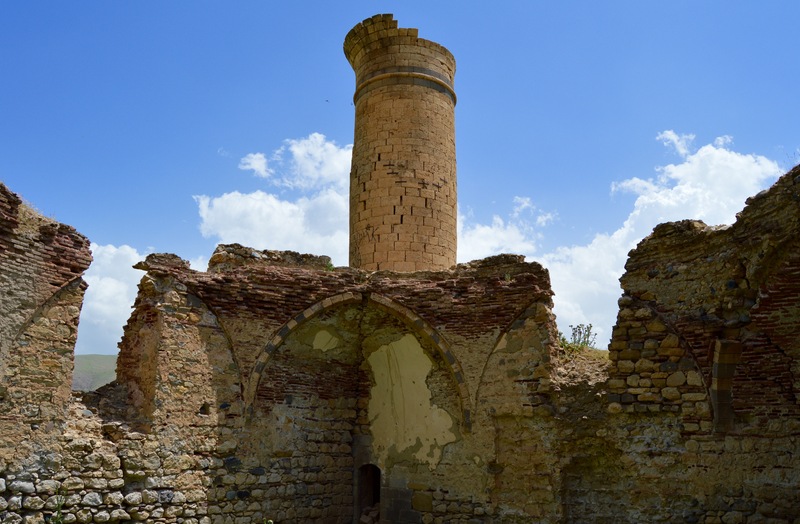 His anger subsided only when we passed the turning for Dorutay where I was told that some turbes are pilgrimage sites for Alevis and Bektashis. 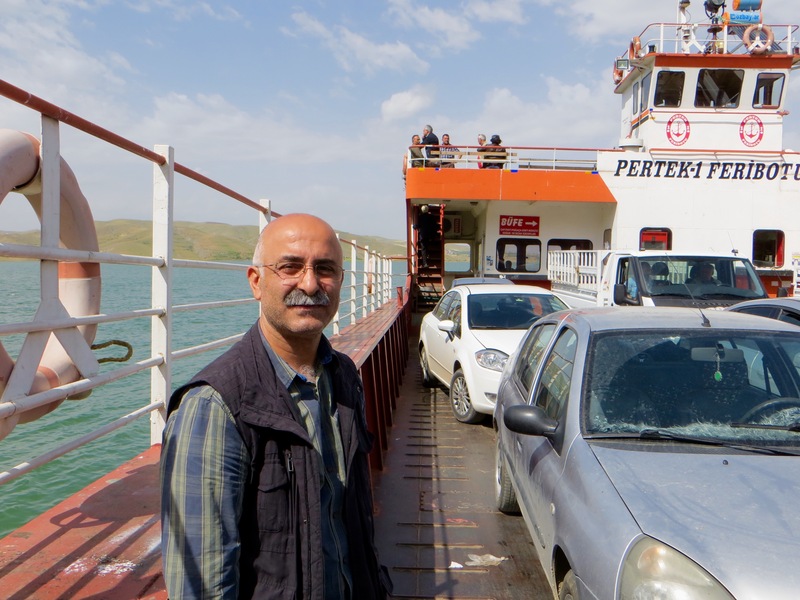 The Kurdish Bektashis who gave me a lift to the ferry terminal, Pertek. 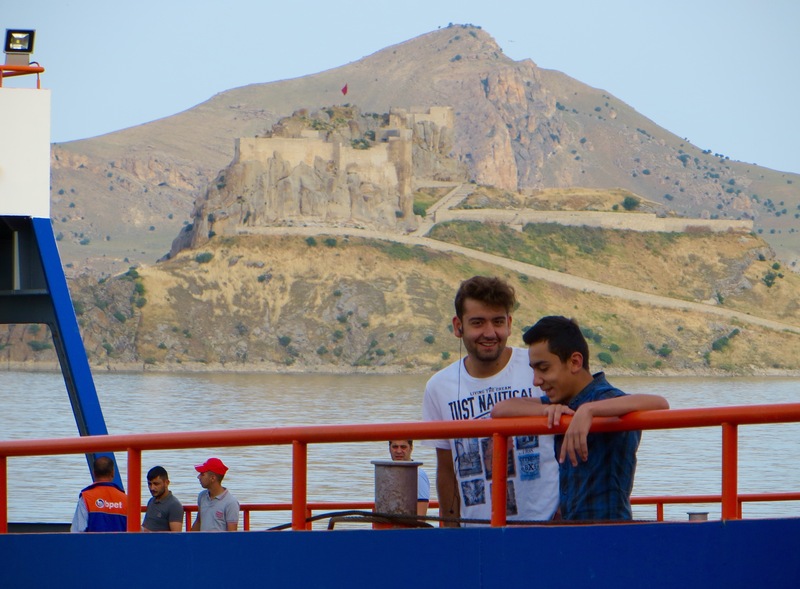 I stayed with the men until we arrived at the terminal because I wanted to take some photos of the castle and the ferry in the excellent early evening light, then I went to the hotel, showered and changed my clothes. 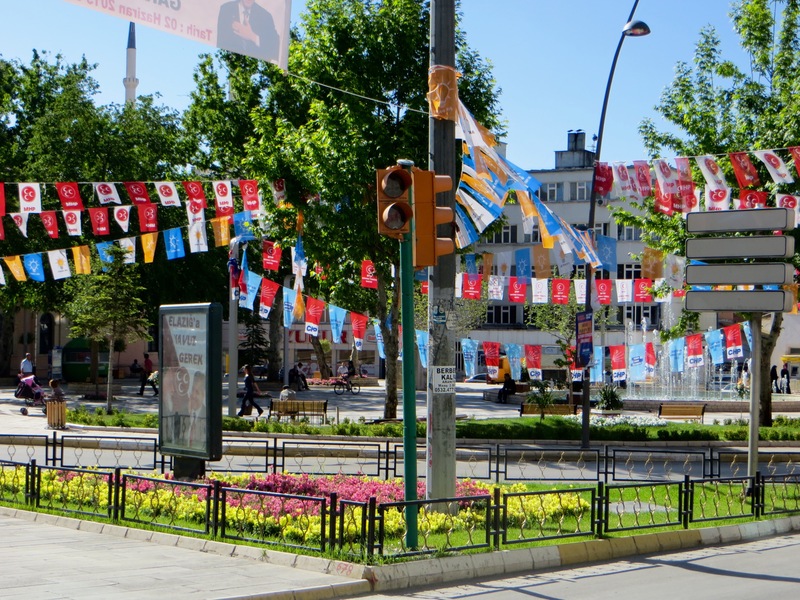 I walked toward the roundabout with the large peace sign in the middle knowing that, before I got there, I would arrive at a small roadside bufe selling beer and snacks. 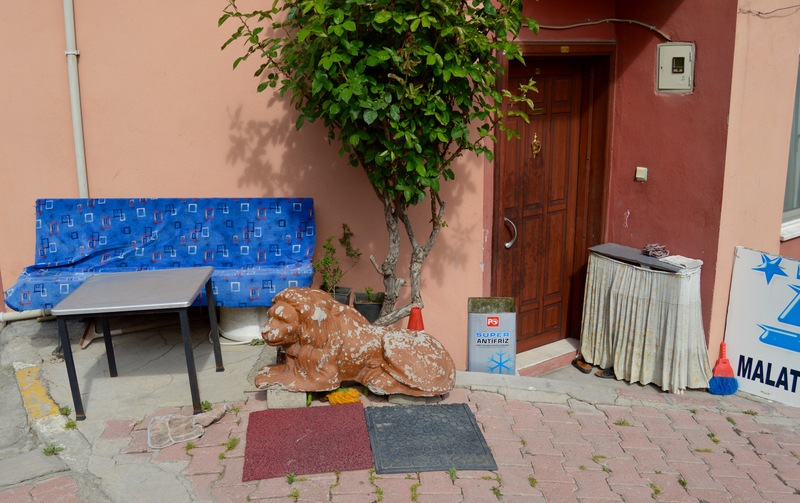 I bought a beer and a packet of crisps, which, along with a boiled egg saved from a breakfast in Tunceli two days earlier, and a packet of salt left over from a THY meal at the start of the trip, was all I could consume given the excellent lunch and the ice cream earlier in the day. On the way back from the bufe the setting sun filled the sky with vibrant colours. 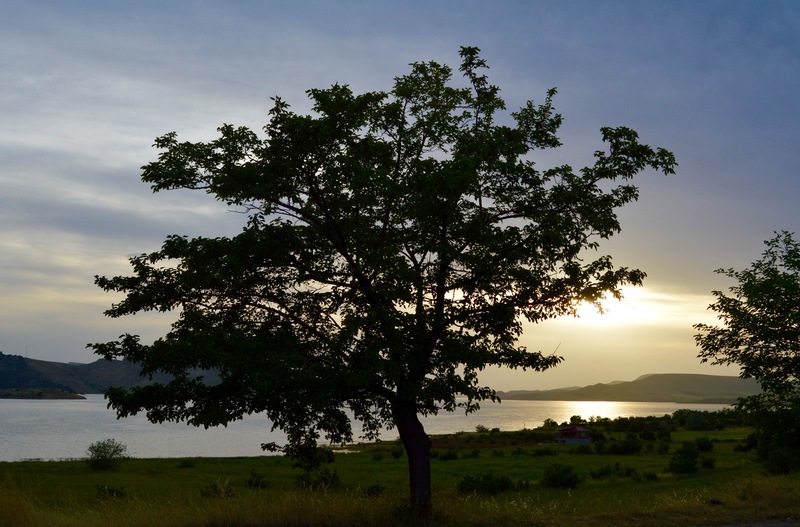 I lined up some trees so they stood in silhouette in front of the reservoir and the multi-coloured sky, and clicked away. A little later I walked beside the large jandarma post near the hotel so I could take photos of the castle from beside a small jetty. One of the men on guard duty in a tower overlooking the reservoir reminded me not to point the camera toward the jandarma post. Pertek Kale and the ferry. I examined the photographic results of a brilliant day’s adventures as I consumed my evening meal in my very comfortable bedroom. 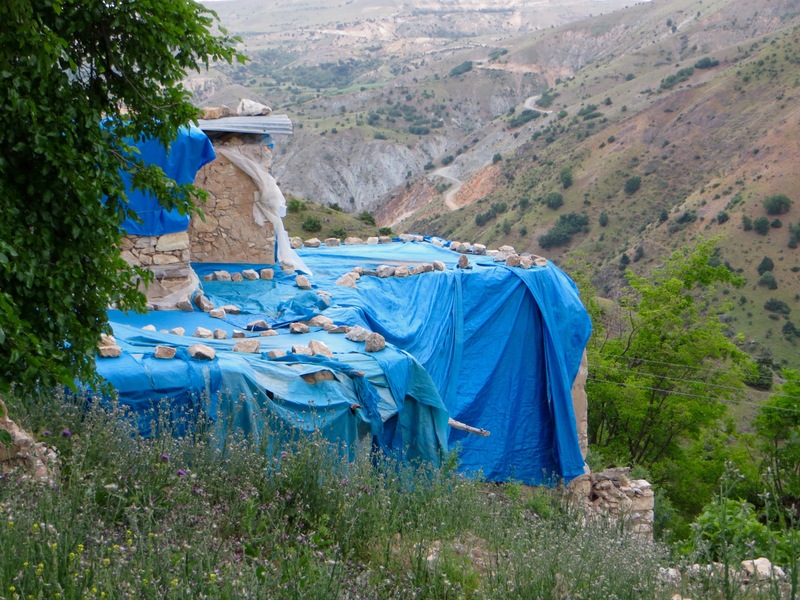 One thing I noticed was that there were not as many wild flowers – in variety or total number – as in the parts of Dersim visited the two previous days, but there were certainly enough to make it worthwhile to arrange beehives on the hillsides and along the valley floors. 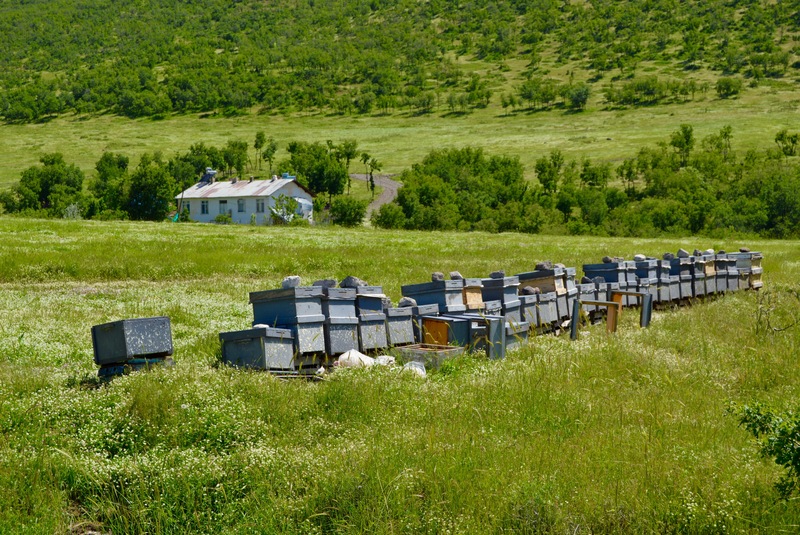 In fact, at one point I had seen what proved the trip’s largest single collection of beehives in one place, a number far exceeding a hundred, and the beehives belonged to the same two or three men. To Pertek and the Termal Hotel. There was more song this morning that sounded devotional, but at 6.30am instead of 4.00am, and the chanting had a different quality to it. 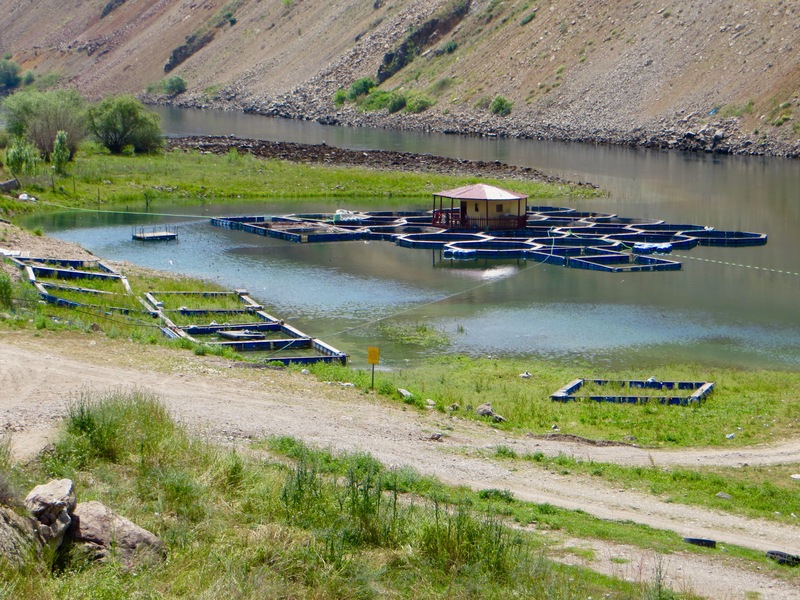 I was going to miss Tunceli, of that there was no doubt. I consumed my breakfast, packed the last few things into my bags, settled the hotel bill and walked the 30 or so metres to where the minibuses left for Pertek. I caught the 8.00am departure with five minutes to spare. 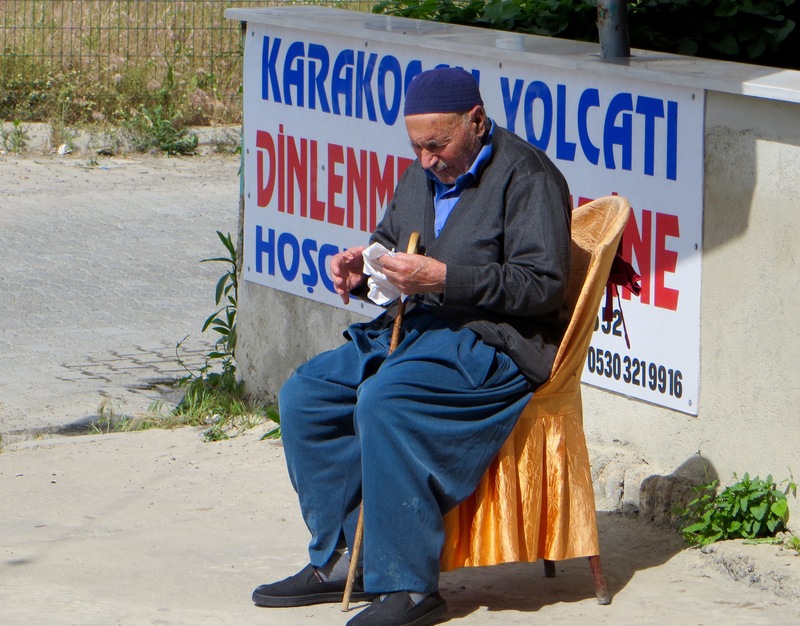 When we left from the Cagdas bus company office there were only four passengers aboard, but by the time we were among Tunceli’s most distant southerly suburbs only five seats were free. 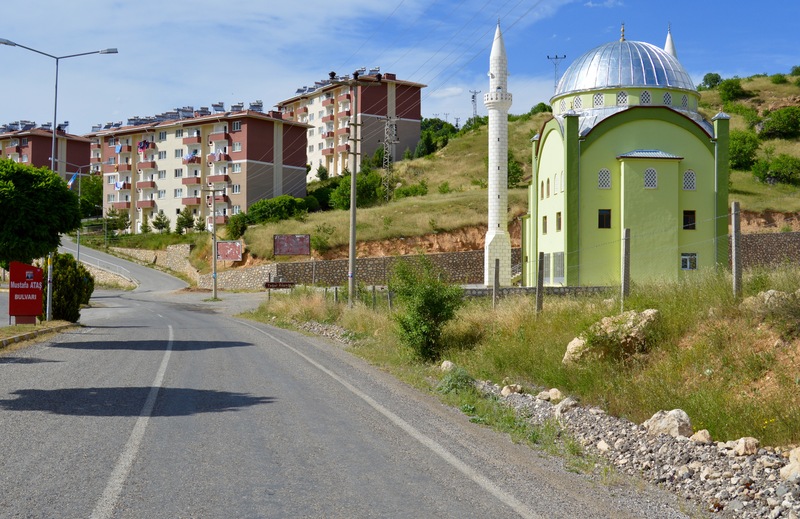 As we made our way toward the entrance to the university campus, I reflected for the last time about Tunceli’s population. Taken collectively, the town had the most secular-minded population I had encountered so far, and would encounter for the remaining few days of the trip. People with a faith commitment seemed to express their commitment in a pragmatic, tolerant and live-and-let-live manner, so much so that in forty-eight hours I did not once see a woman dressed from head to foot in black, or a woman who covered her face except the eyes and the top of her nose, or a woman who walked two or three paces behind a male family member, who elsewhere on the trip was usually her husband. Women wearing headscarves constituted 15% of the female population at the most. Women drove cars, played a significant role in the local economy similar to that of men and earned a living in many town centre offices and businesses in the more affluent suburbs. 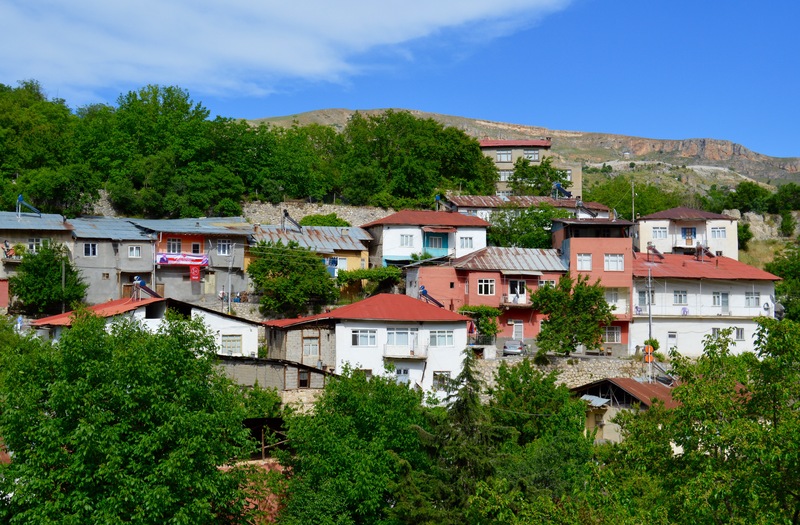 Tunceli does not have any buildings of architectural importance, but its situation beside the Munzur Cayi, the surrounding hills and mountains, the liberal outlook of its citizens and the many interesting destinations in the region, make it for me one of Turkey’s most appealing provincial capitals. 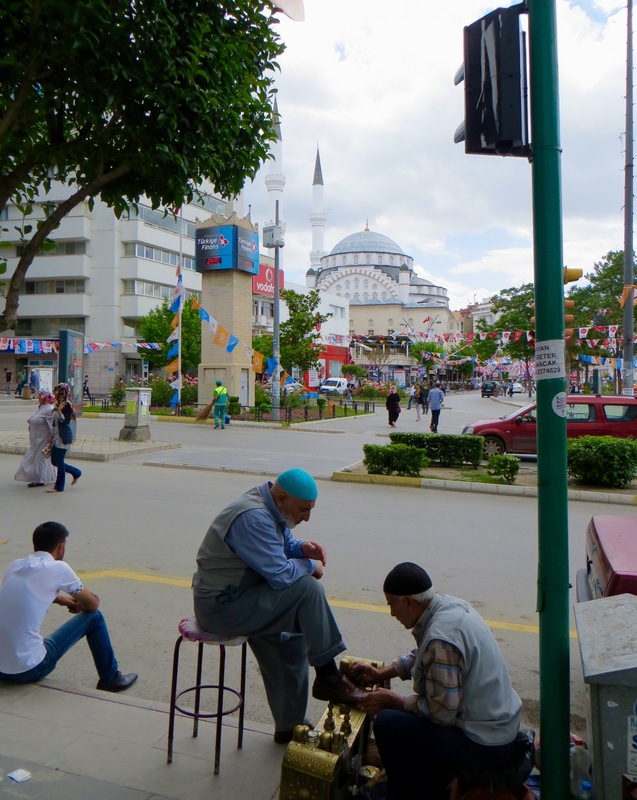 Moreover, with Erzincan and Elazig not far away, those deprived of walks on the Sunni side of the street have only a short distance to travel. The cloud of the evening and night before had completely disappeared. Bright sunshine, a few puffs of white cloud and a gentle breeze made everything look enchanting once we were beyond the entrance to the university campus. A road to the right had a sign beside it indicating that Rabat Kale lay 20 kilometres away. 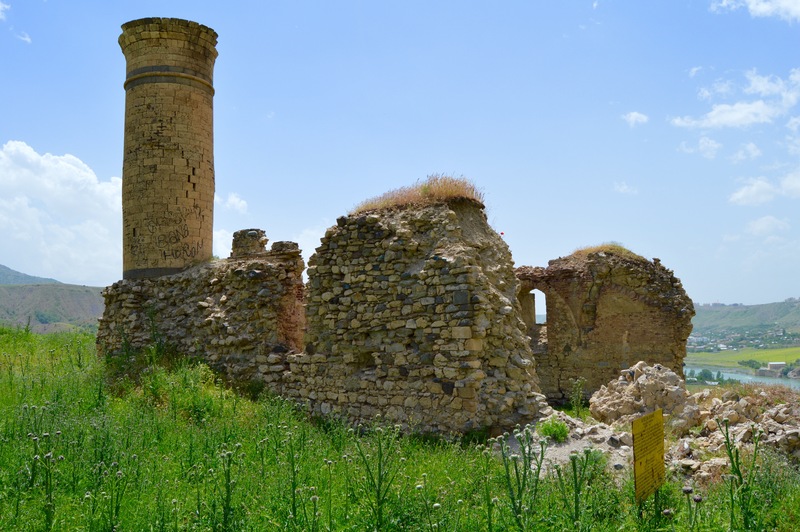 Someone the day before had said that Rabat Kale was an interesting destination and that the full extent of its interest has yet to be established (Rabat Kale is said to have Urartian and Hellenistic connections, among others). Was this further confirmation that a return to the area was required? Most definitely. The minibus left the main road to Elazig because, although destined for this large city in which I had stayed a few days earlier, it was going via the town of Pertek to connect with the ferry that crosses the Keban Reservoir, thereby saving many kilometres and, more often than not, some time. 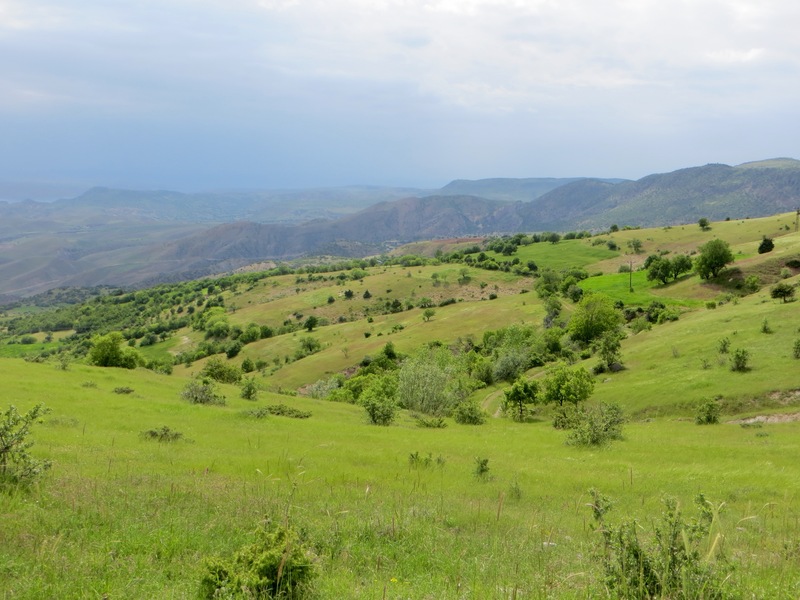 Pertek is 36 kilometres from the road junction and, with a few twists and turns as we made an ascent, we were soon among hills, stunted trees, wild flowers, beehives and pasture grazed by cattle, sheep and goats. 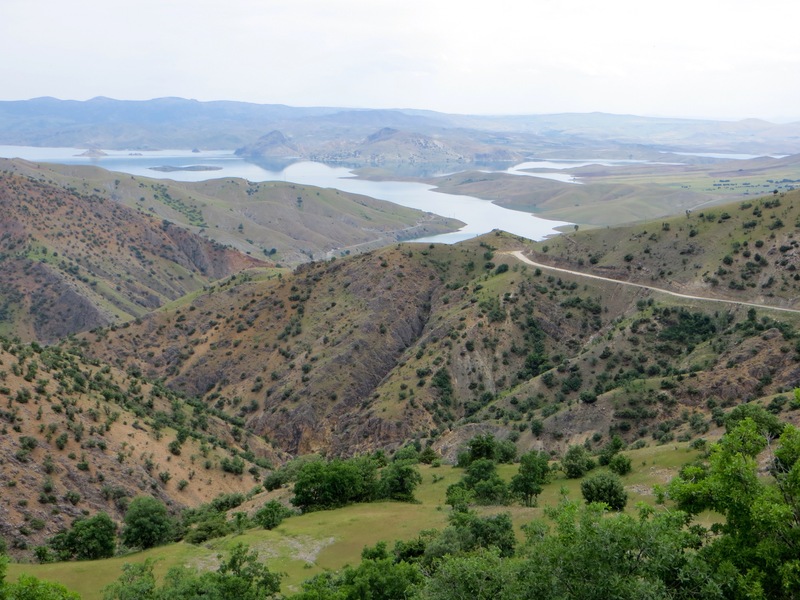 As we enjoyed a last view of the Munzur Cayi, now part of the Keban Reservoir which is so large it is encountered along many roads, we arrived in the dispersed village of Yolkonak where mostly modern houses enjoy extensive views south and east. Each house seems to have around it a large garden with many trees. Beydami, the next settlement along the road, stands in undulating countryside surrounded by rounded hills. Beydami marks the point where the road begins to cross an upland plain with fields and orchards. After passing a quarry we started to descend, but hills and mountains still dominated the distant views. 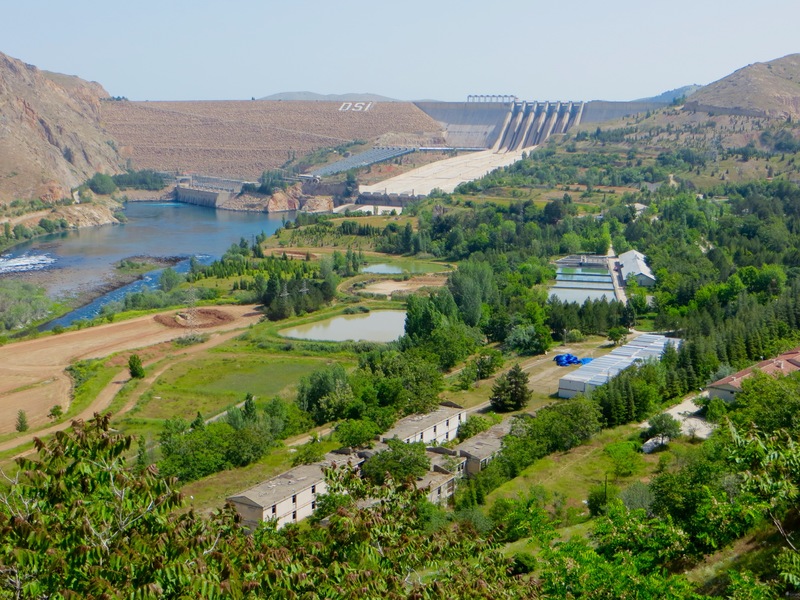 We were about 13 kilometres from Pertek and, ahead, the Keban Reservoir came into view again, this time to the south-west rather than the east. I thought I detected in the grass and the fields a hint of paleness that suggested conditions were a little drier and hotter than in and immediately around Tunceli, despite Tunceli being so close. In what I think was Mercimek, a village about 3 kilometres from the centre of Pertek, there are some large timber-framed and mudbrick houses with flat roofs that would be worth examining more closely, but I sensed that other delights lay ahead without undertaking what might be a time-consuming detour. 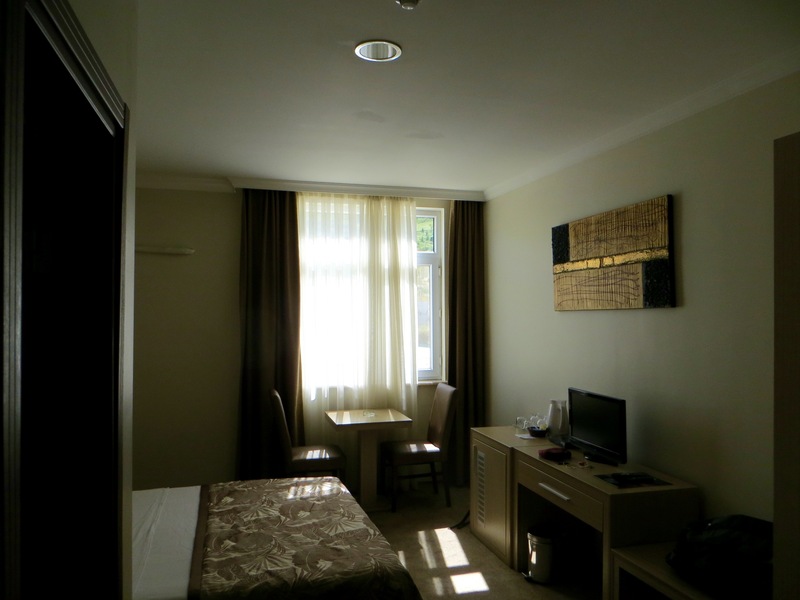 I unwisely got off the minibus in Pertek, which looked overwhelmingly modern on first inspection, only to find that the only hotel locally is the Termal about 5 or 6 kilometres outside the town centre not far from where the ferry arrives and departs. Very kindly, an off-duty police officer directed me to his car and drove me to the hotel, a large modern hotel with a swimming pool and sauna utilising a local source of hot water. The hot water provides guests or visitors for the day with an opportunity to engage in recreation or access unproven cures for ill-health. I would not usually stay in a Turkish hotel with such facilities charging guests a lot by local standards, but the locality lacked accommodation alternatives; its situation beside the reservoir was a delight; the surrounding area promised many pleasant surprises to add to those already acquired in Dersim (everywhere I would visit for the next two days was in Dersim); the ferry terminal was nearby allowing me to access my next destination with ease; and I was asked to pay only 100TL (about £27) for a night in a double room similar in size to a hotel room in the USA. The room came with en suite facilities and breakfast. I immediately agreed to stay two nights and must confess that I enjoyed every moment of the self-indulgence. Oh yes. 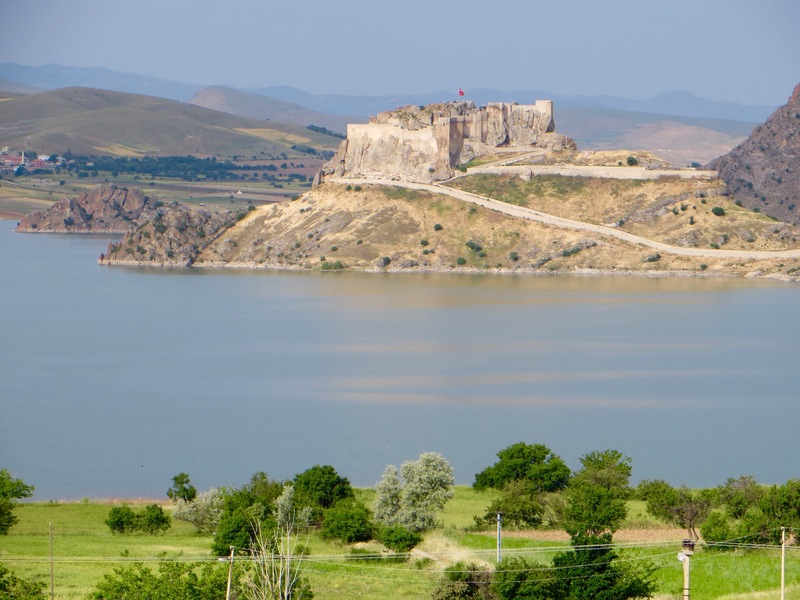 Because the Keban Reservoir drowned old Pertek, all that remains of the town where it originally stood is the castle, which crowns what is now an island in the reservoir. 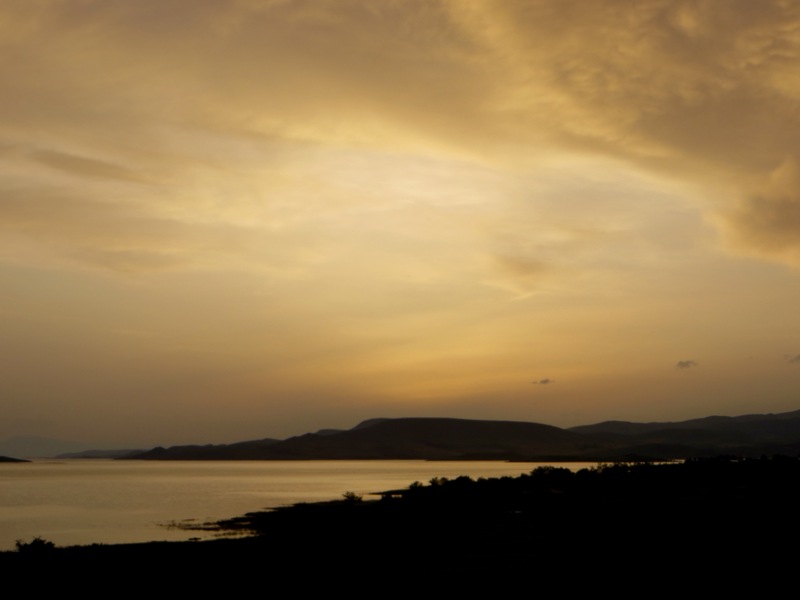 The hotel and its extensive grounds provide excellent views of the island and the castle. 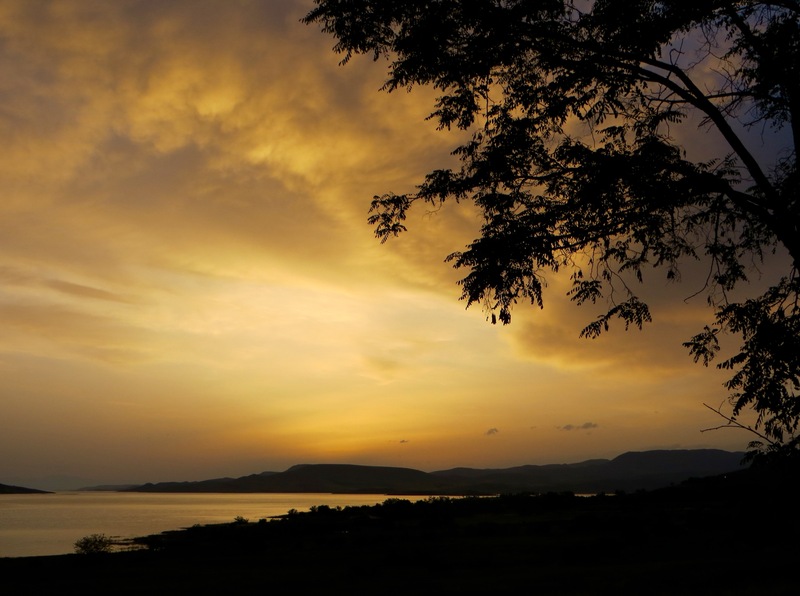 Moreover, both evenings at the hotel I witnessed attractive sunsets. 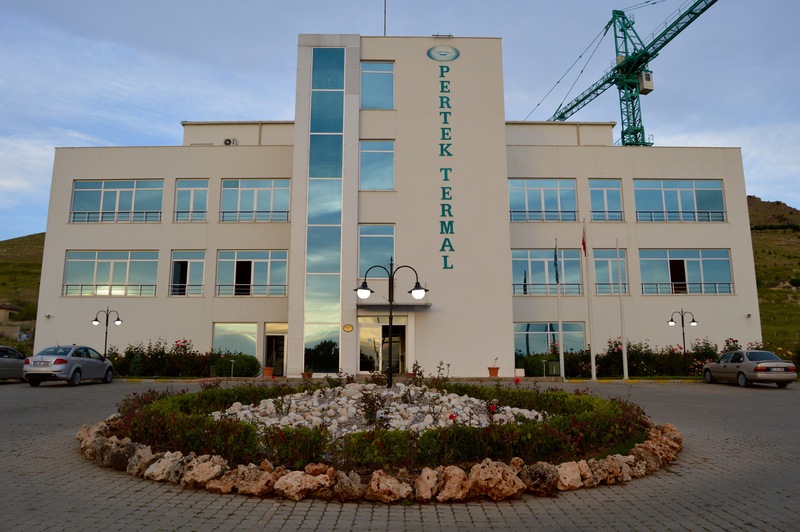 Is everyone a winner at the Termel Hotel near the modern town of Pertek? You bet.